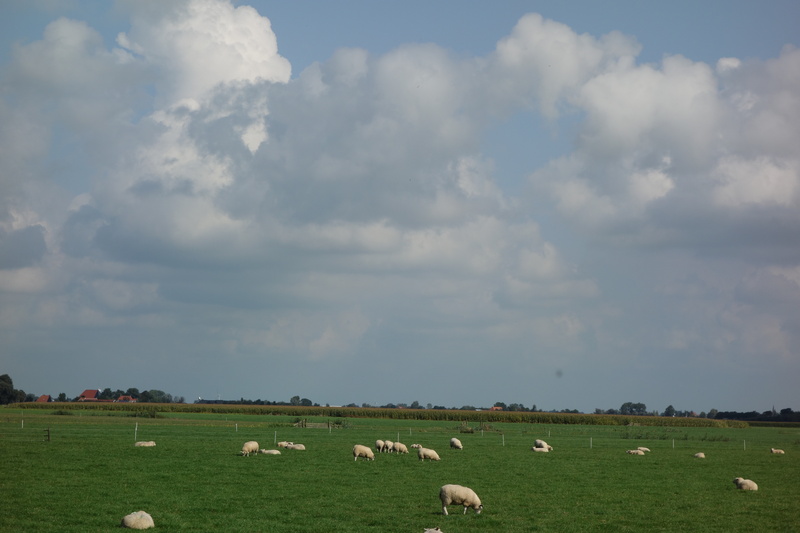 In Friesland, to be exact. 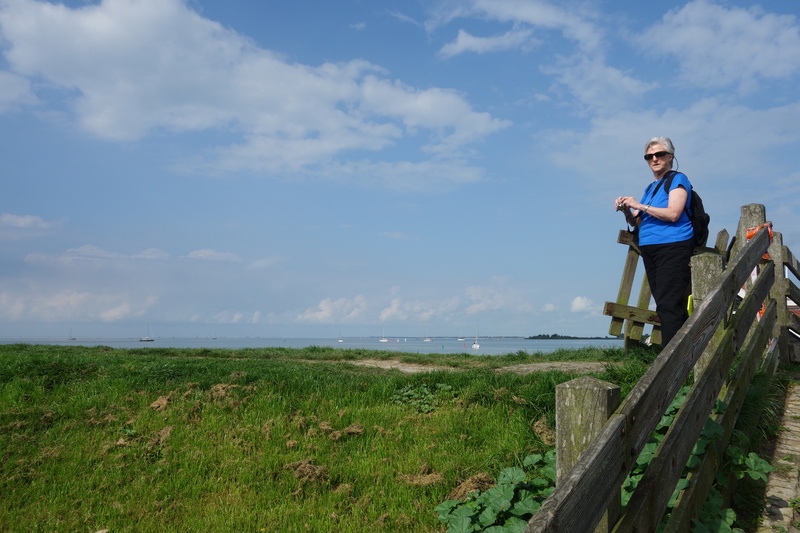 We took a day trip in memory of Pat, who always told us that Friesland, where his family comes from, is NOT the same as the Netherlands. Plus, Judy told me how beautiful it was, so we went. We rented a car at the airport, neglecting to bring our passports, since we usually travel with photocopies and leave the originals in our rooms. Luckily, the nice car agent assessed us as harmless if gormless old ladies and allowed us to proceed without the proper documentation. Whew! 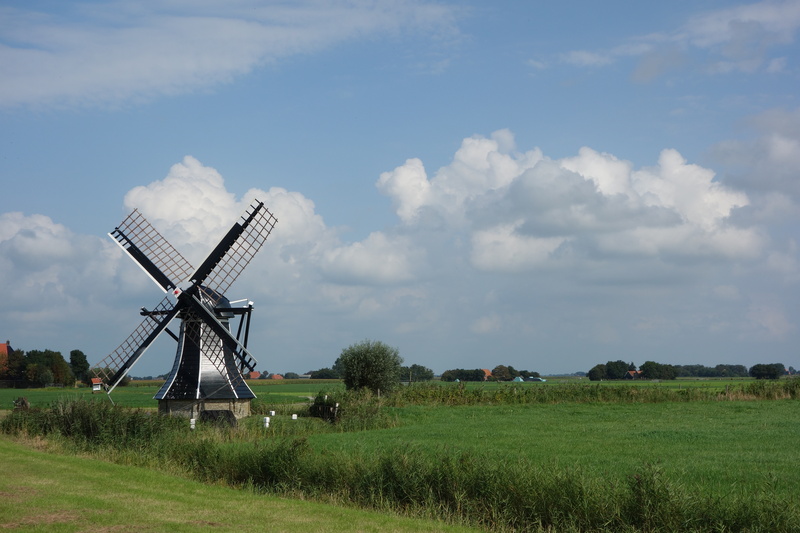 Since the Dutch sensibly drive on the right side of the road, the trip was not difficult. 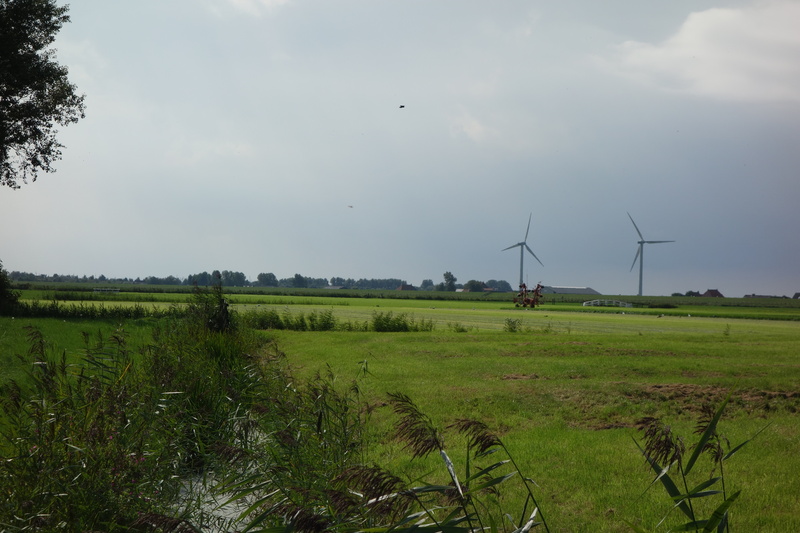 We were traveling north of Amsterdam and slightly east, up the narrow peninsula that used to end in water. 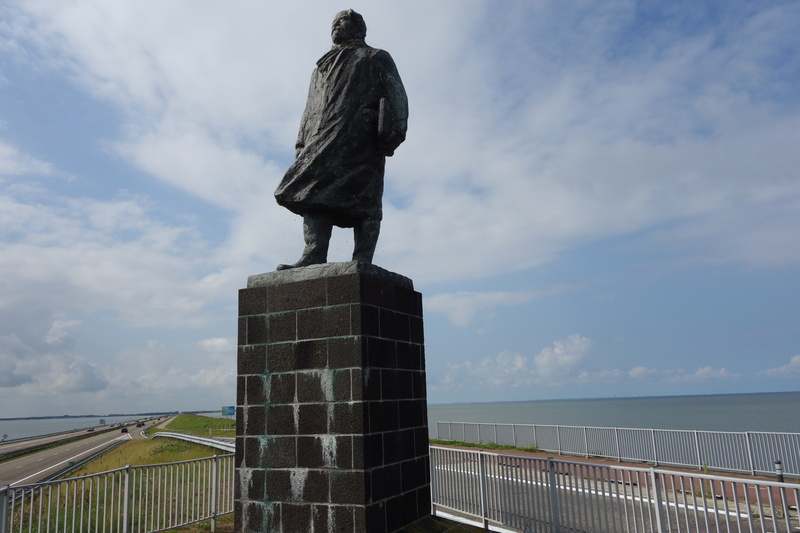 Since 1932 when Afsluitdijk was built, there has been a causeway between the Zuider Zee, a salt water inlet of the North Sea and the IJsselmeer, which is fresh. Can you tell I got these details from Wikipedia? Here is the engineer who made it all happen but died before the dike was completed. He looks a lot like Churchill. You can see the two bodies of water separated by the dike. 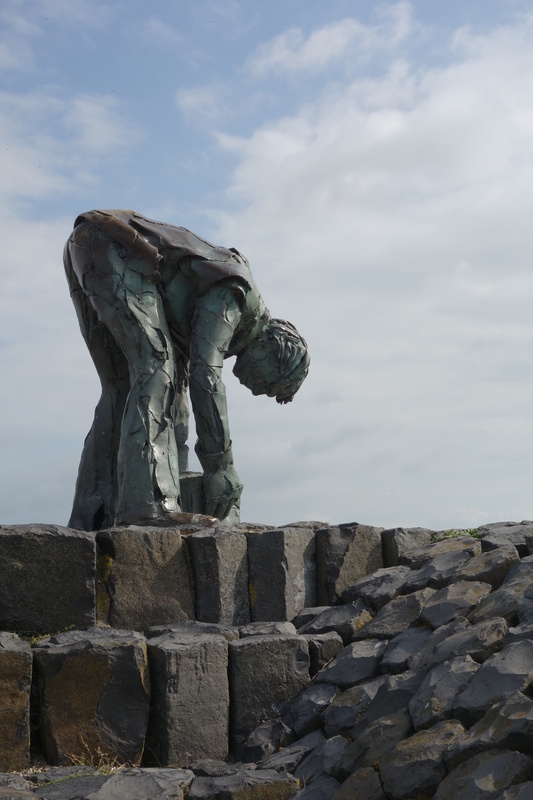 Building it was a heroic endeavor, and to honor that work is a statue of a young man laying the stones that make up part of the dike. 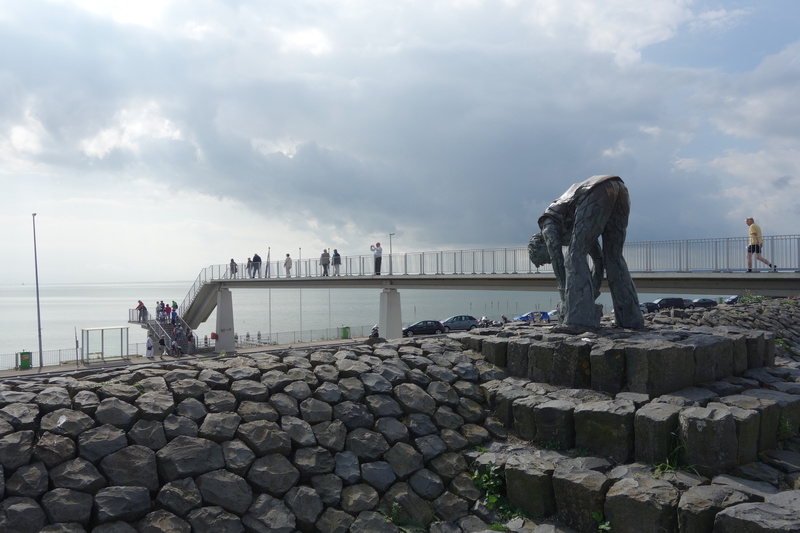 The whole thing is quite a tourist attraction, with a layby offering coffee and snacks (stroopwaffel) and a walkway to the other side. There are also informative signs about the differences between the saltwater and freshwater environments. 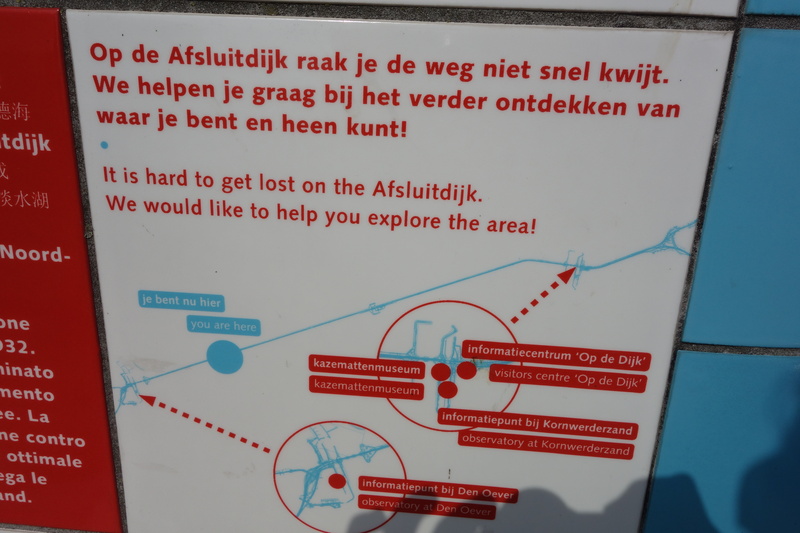 But my favorite was this one: Indeed, we managed not to get lost one bit! 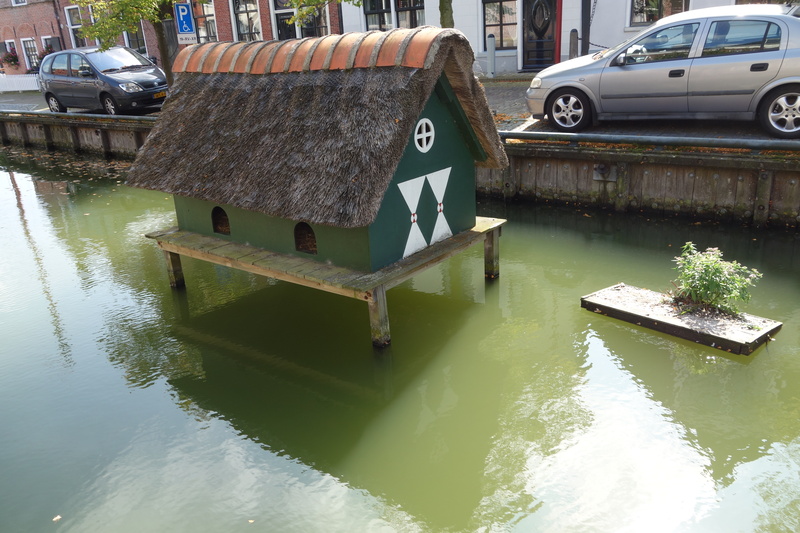 Then we had a wander, enjoying the canals and this little house that someone explained was for pigeons. 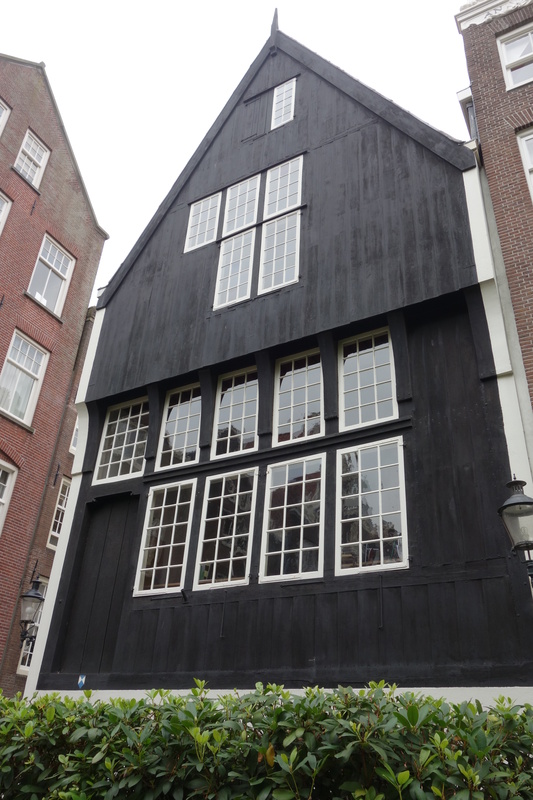 We liked looking in the windows, which in the Dutch way are often wide open day or night, inviting you in. 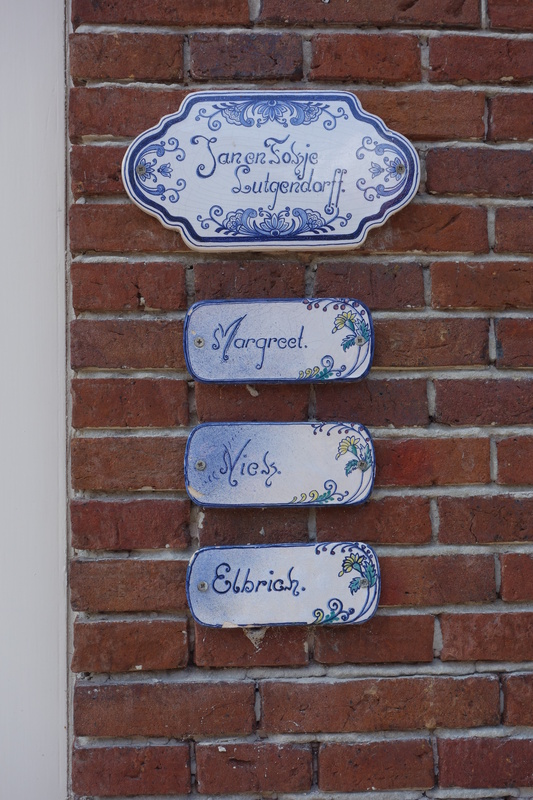 We also enjoyed this family listing outside one door. The old-established pottery in Makkum had closed its shop a year before, although if you have lots of lovely money you can visit them online or even commission something. So we gently moved on. 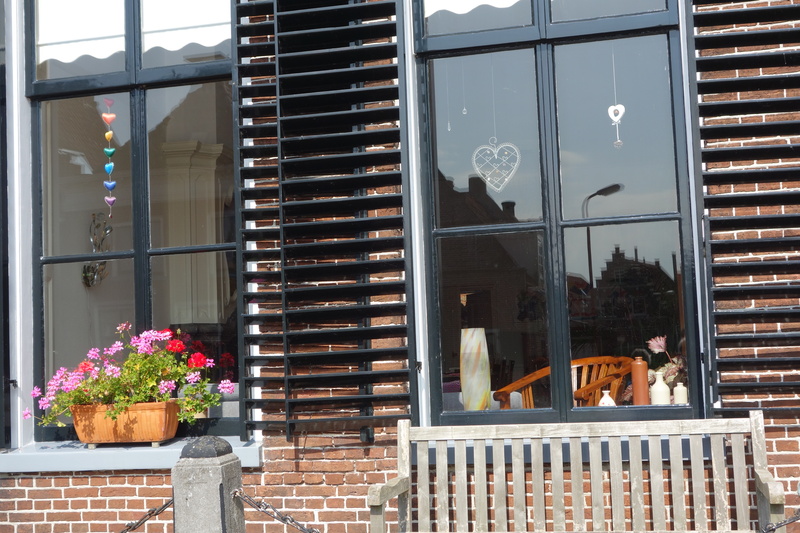 Hindeloopen is known for its painted furniture, but it is also just a charming place. 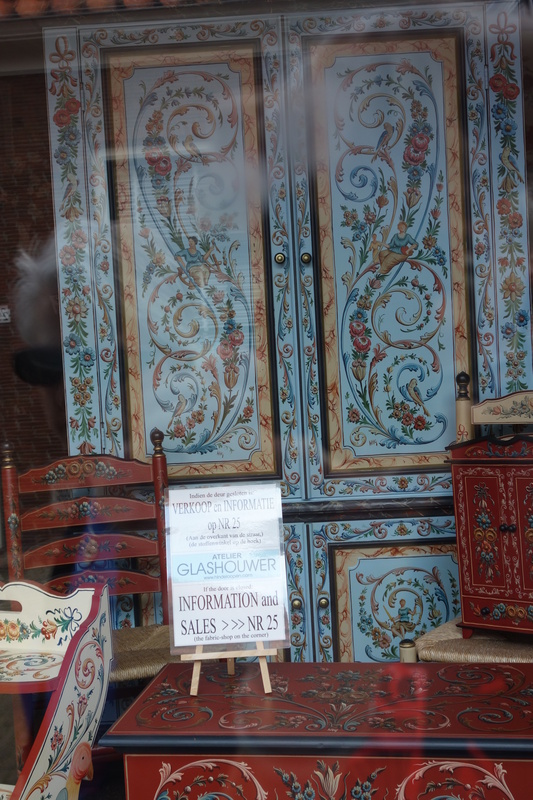 We came across this painted door and saw this chest in a nearby store. 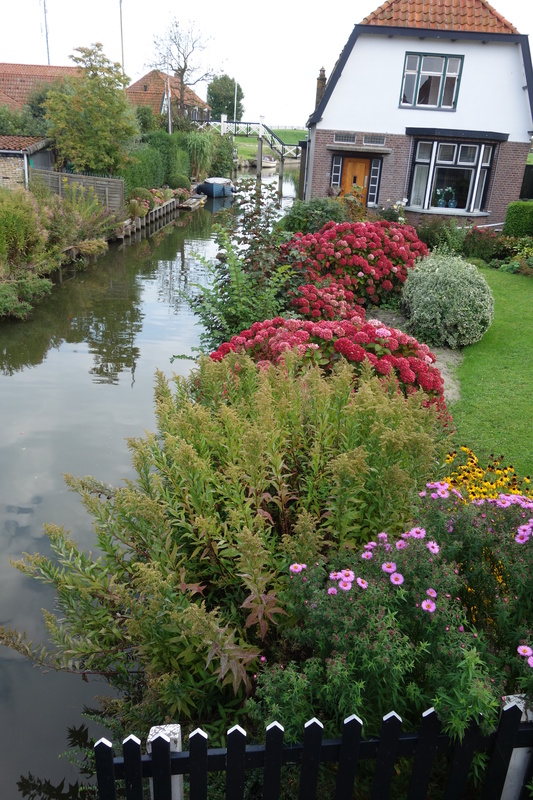 Apart from these charms, Hindeloopen also had lovely gardens and, best of all, a wonderful dike to walk along. 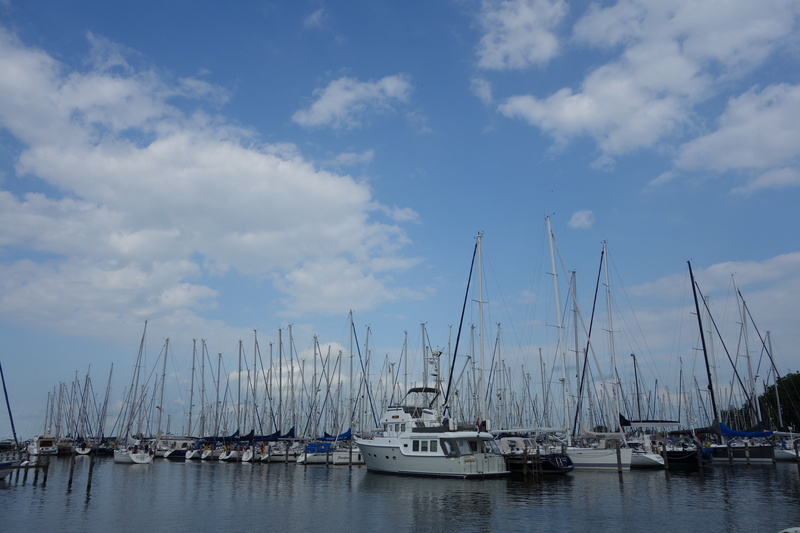 First we walked down to the harbor, where the phrase “a forest of masts” must have come from. 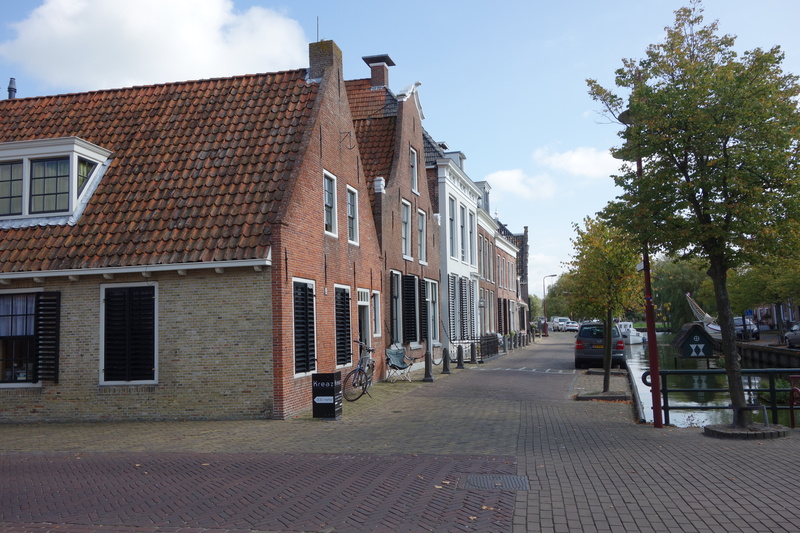 Then we walked around the town to the dike. 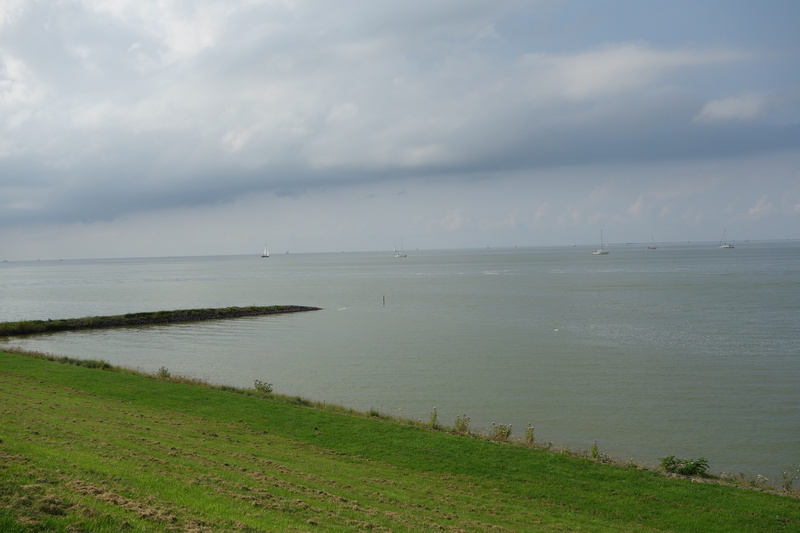 It really is just an embankment that keeps the sea away. You climb up a small hill, walk through a stile, and there you are. This scene could have come right out of a 17th century Dutch painting. I don’t think much has changed. 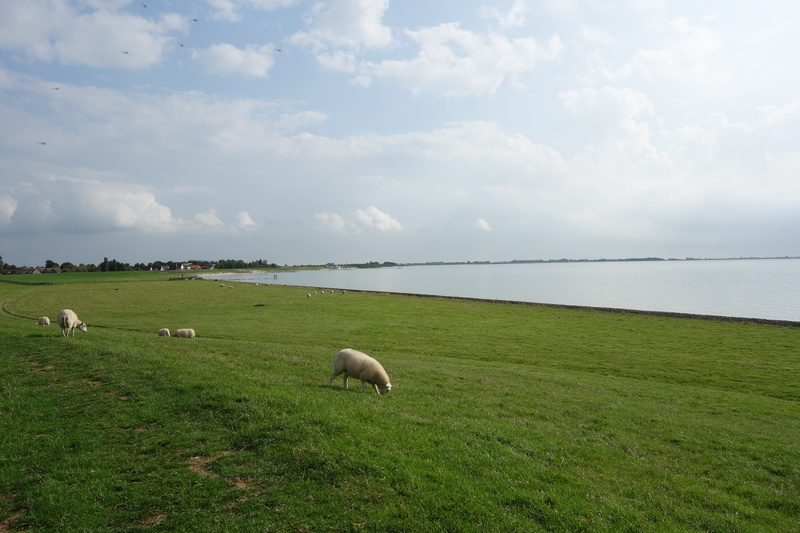 There was nothing to see on this sunny day but sky, sea, sheep and the Dutch at play. 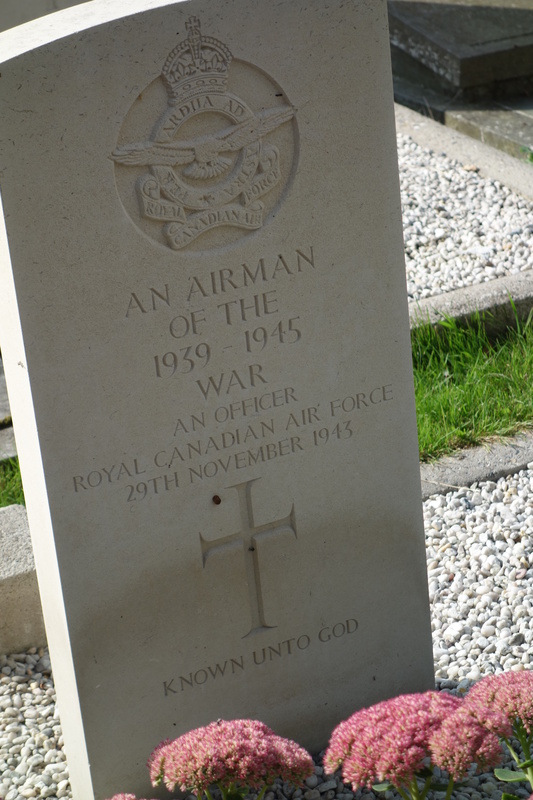 We paid a brief visit to the Commonwealth graves outside a church, marking the anonymous airmen who died here during the war. Then it was back down the road, across the big dike, and home again. We got our bearings by following Rick Steves’ podcast city tour through some touristy highlights. 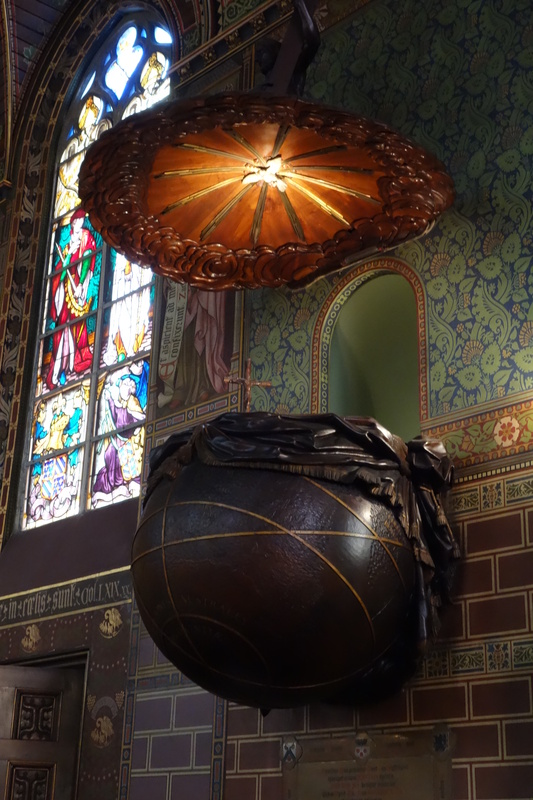 From Central Station, the Victorian red brick building where every journey begins, a short tram ride along Damrak brought us to Dam Square, the center of the historic district. 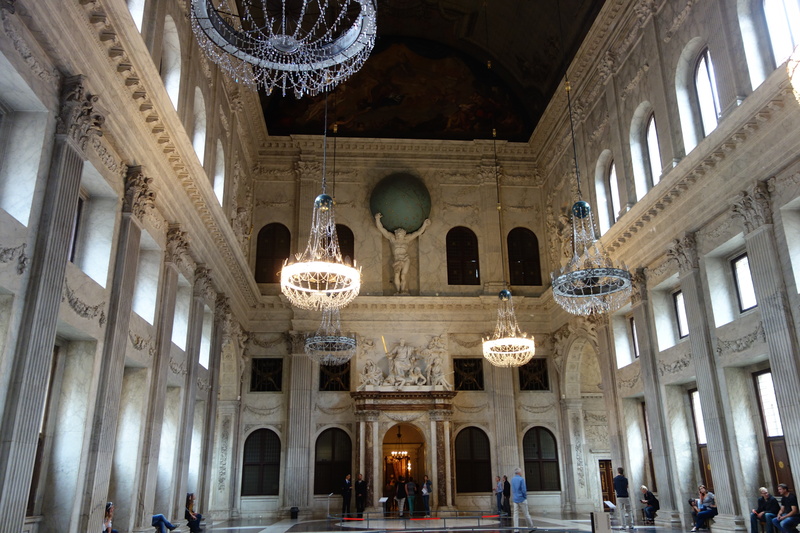 We dutifully went into the Royal Palace (aka City Hall), so named by Napoleon’s brother. 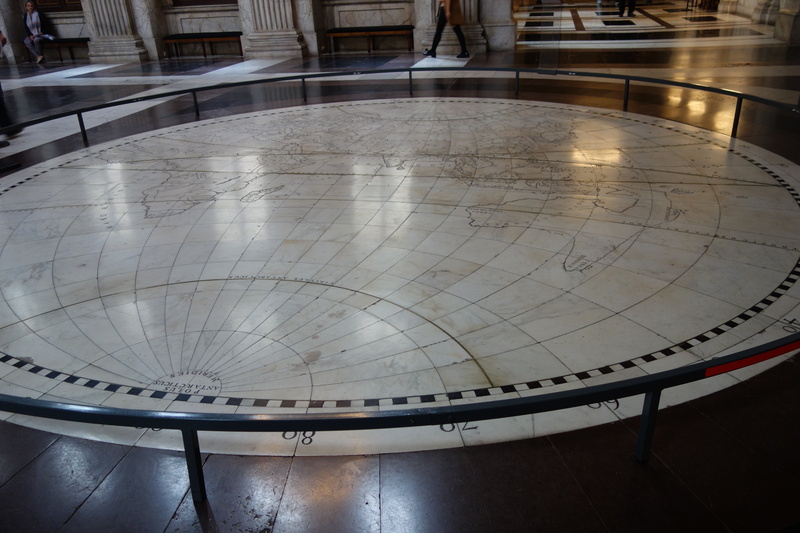 The central hall was quite impressive, if you like marble floor maps and classical statues. 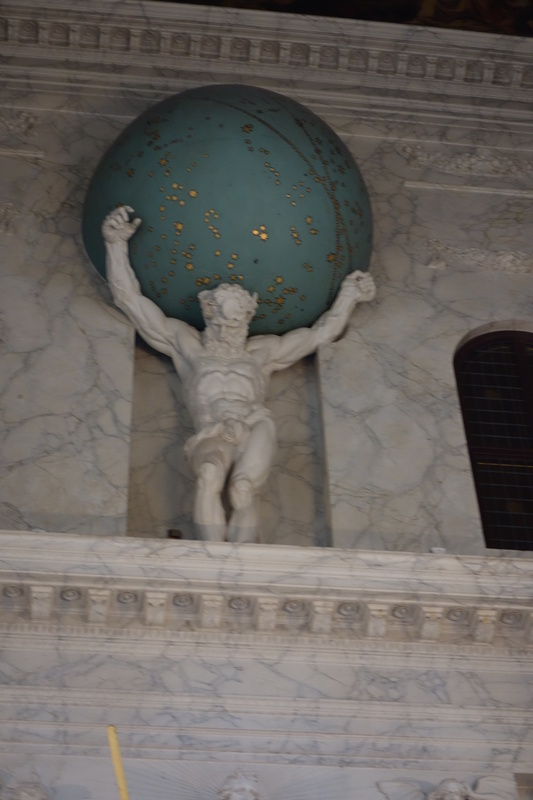 Here is part of the world circa 1750. and a close-up of Atlas. Unseen above is a painted ceiling showing Amsterdam triumphant. Enough. We moved on to the hidden Catholic church. There are several of these dating from the Reformation. This one is located on what’s now a very busy tourist street. It’s known as the Papegaai, meaning parrot, after the bird carved into a niche at the entrance. Inside all was calm and serene in contrast to the commercial bustle outside. 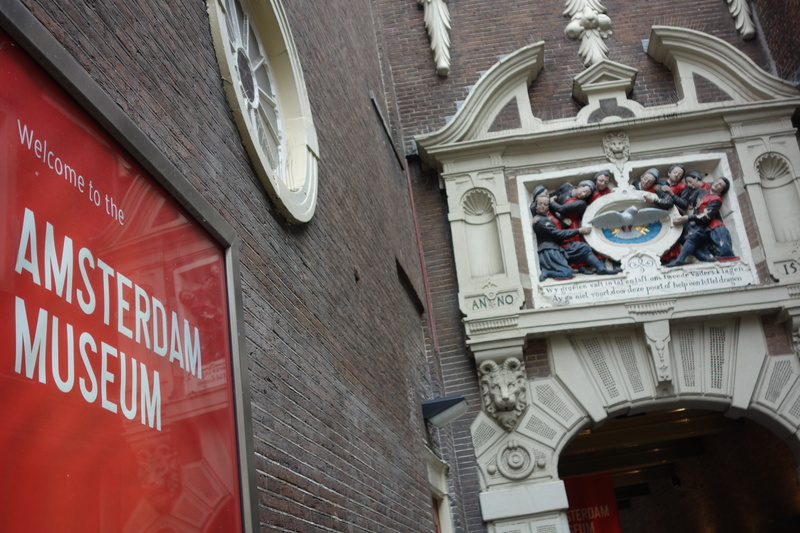 Just around the corner is the Amsterdam Museum, housed in what was once an orphanage. Sharp eyes will see the boys asking for charity in the relief above the entrance. 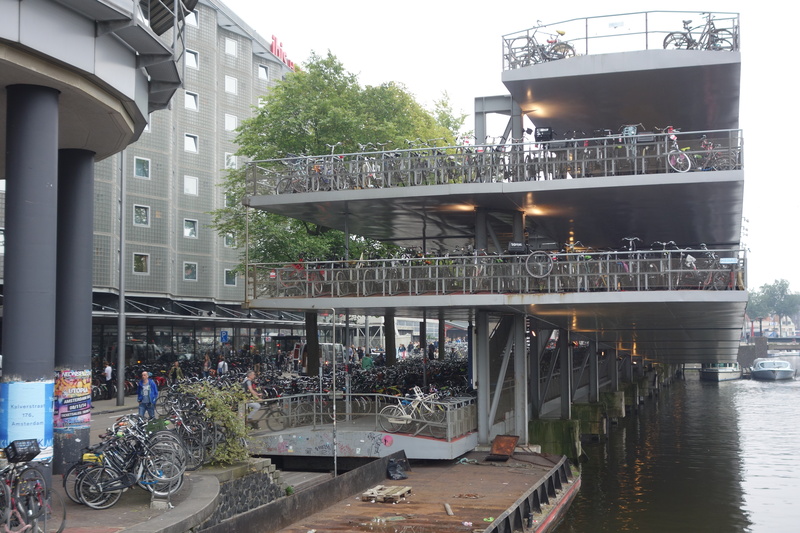 We skipped the museum but did walk through a glassed-in passageway exhibiting contemporary versions of the well-known Dutch civic portrait. The classic is, of course, Rembrandt’s Night Watch (q.v. 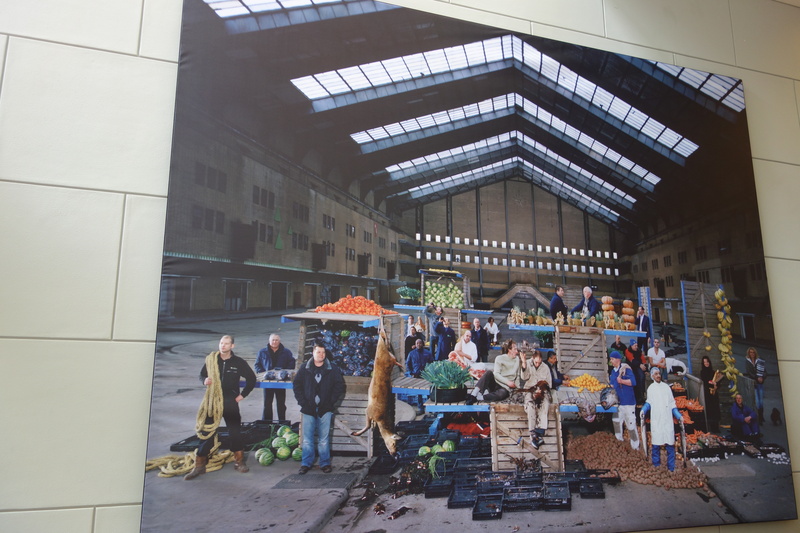 ), while this photograph takes the same approach to workers at an outdoor market. 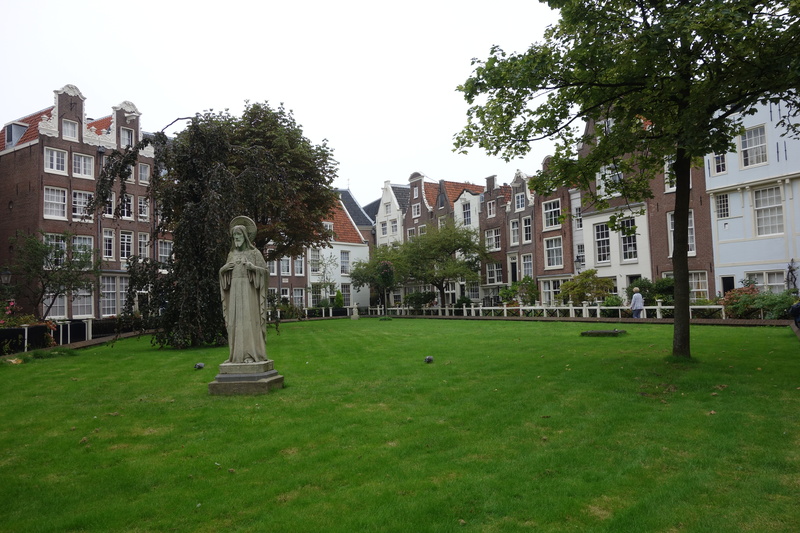 Just around the corner we came to the Begijnhof, a quiet courtyard that used to house pious women starting in the 14th century and now is home to single Catholic women (presumably there is a difference between these two varieties?). Here is the courtyard with the houses around, serene and quiet. 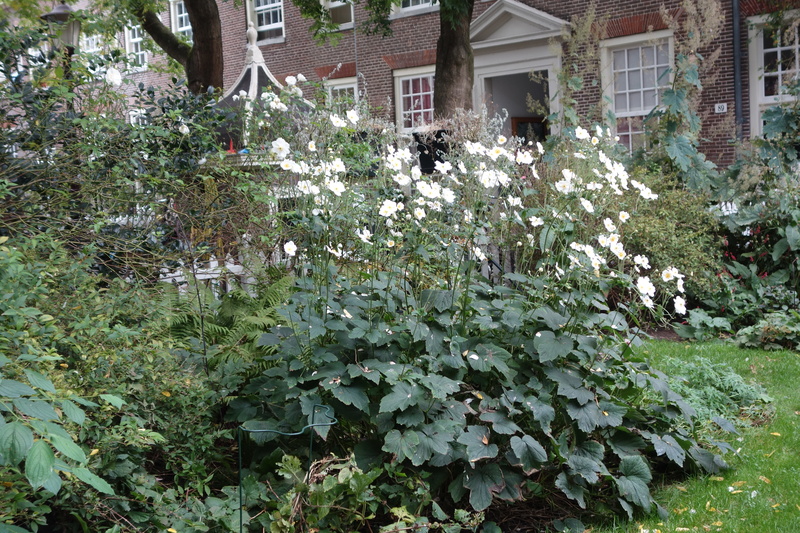 We admired the small gardens like this one, with its imaginative combination of annuals. 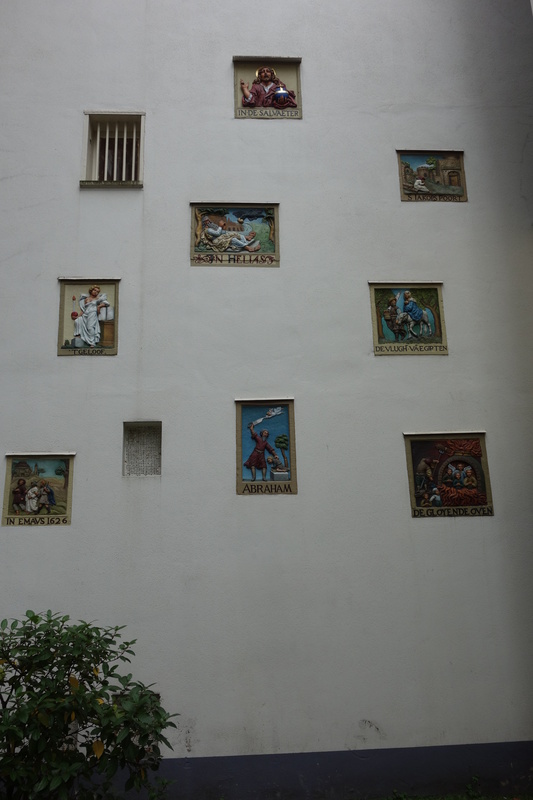 Also of note, the collection of gable stones painted with scenes from the Bible, and the oldest wooden house in the city, dating from 1477. 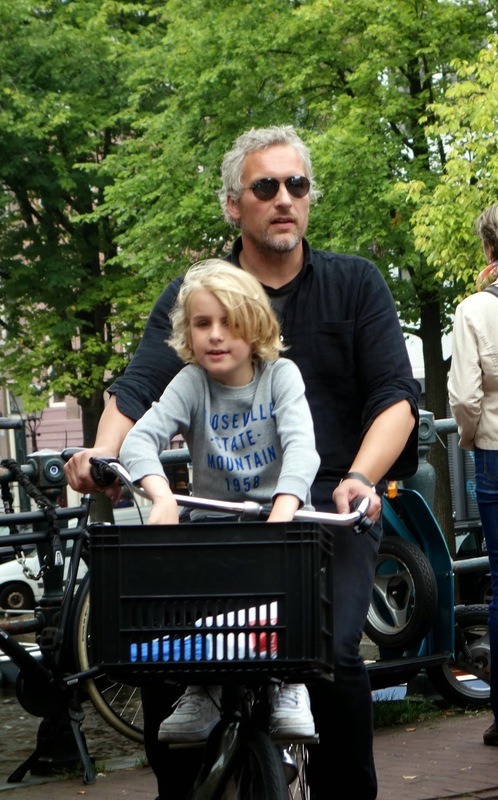 Just around the corner – which seems to be the best direction, next to “just over the canal” – we found Spui Square. 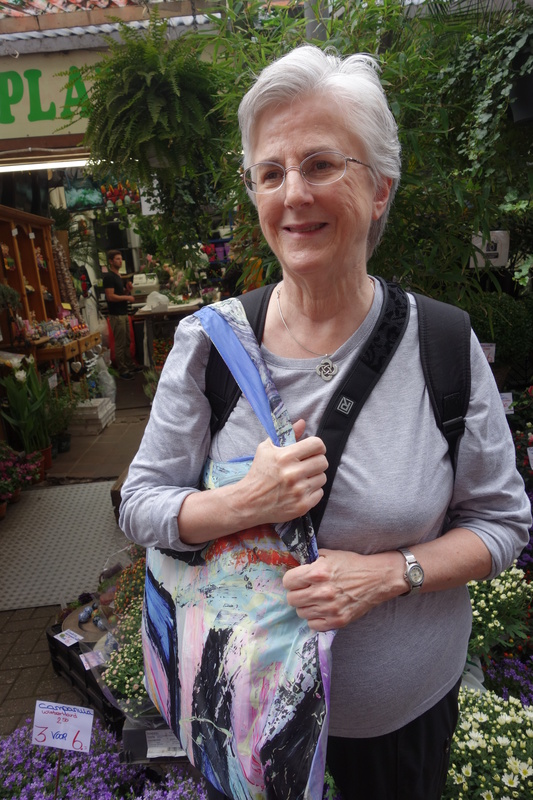 We stopped for lunch at Cafe Hoppe, which has been here since the 17th century. Just as we were finishing our meals, we heard a brass band start to play. Here’s a short clip to give you a sense of the exuberance of the band and the audience. Fun! 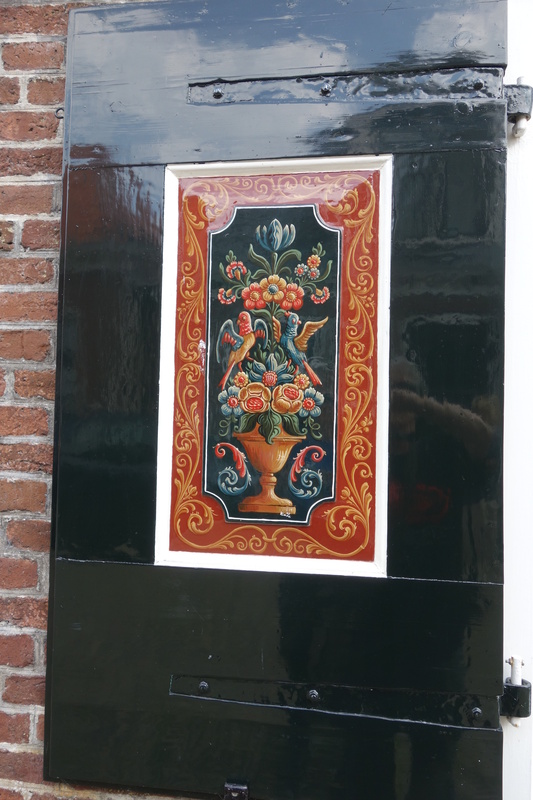 We continued on our walk, past the Mint Tower and the Flower Market, where I had to buy some Rembrandt tulips which of course I could have bought just as well at home, but there you are. Here is my patient companion in front of one of the stalls. Then it was time for a herring break. This popular stand offered raw herring with onion. “How do I eat it?” I asked the friendly purveyor. “Use the flag,” she explained. I speared with herring with the toothpick flag and ate it all up, yum. Speaking of flags, we were beginning to flag just a bit but went home via the Nine Little Streets, a charming shopping district. 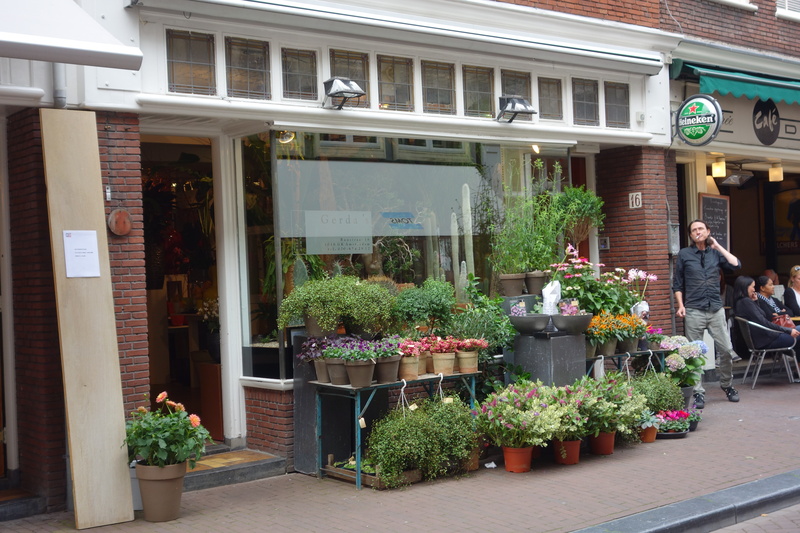 We stopped at this florist shop, very friendly as well as elegant. 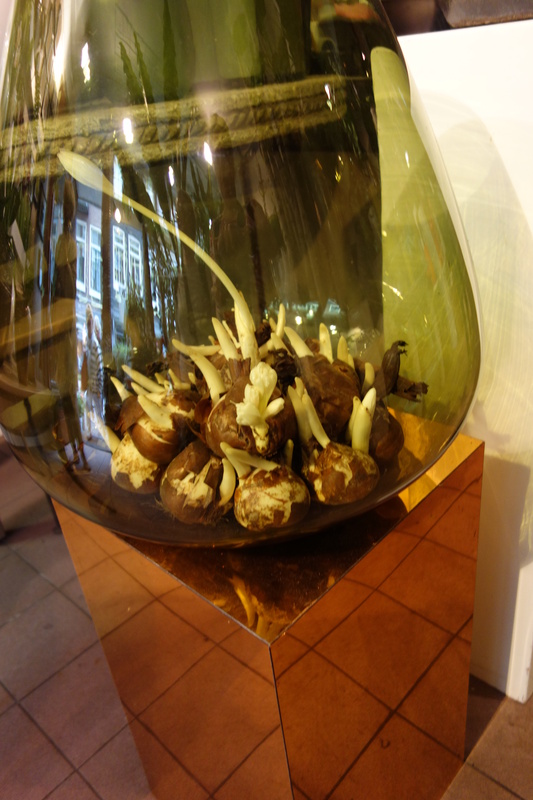 I love these bulbs striving for the light. 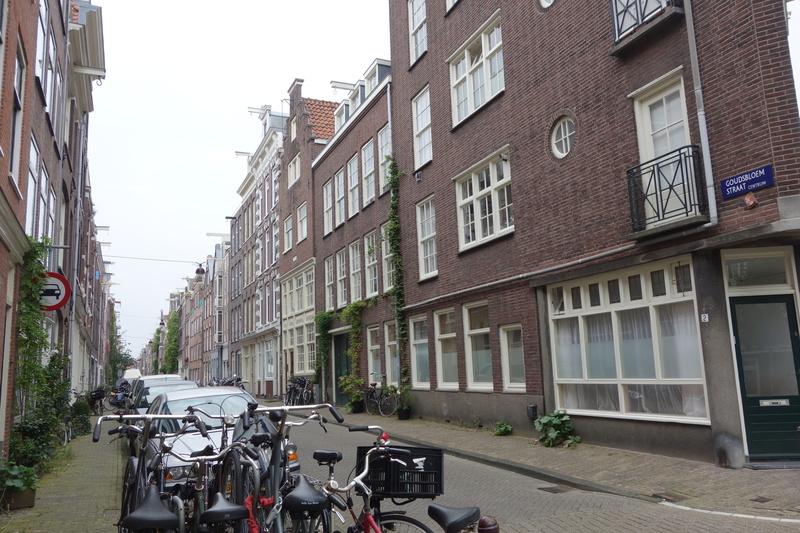 From here we toddled home to our little apartment in the Jordaan. 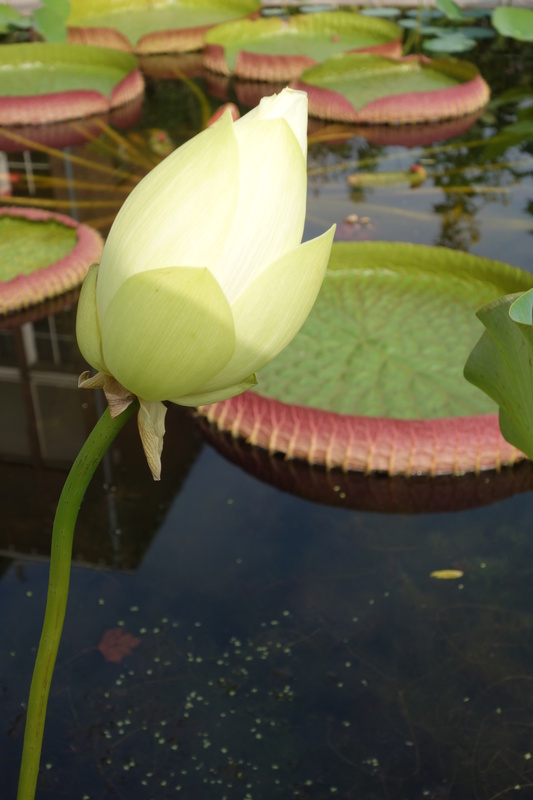 The botanical garden in Amsterdam is one of the oldest in the world and at three acres also one of the smallest. 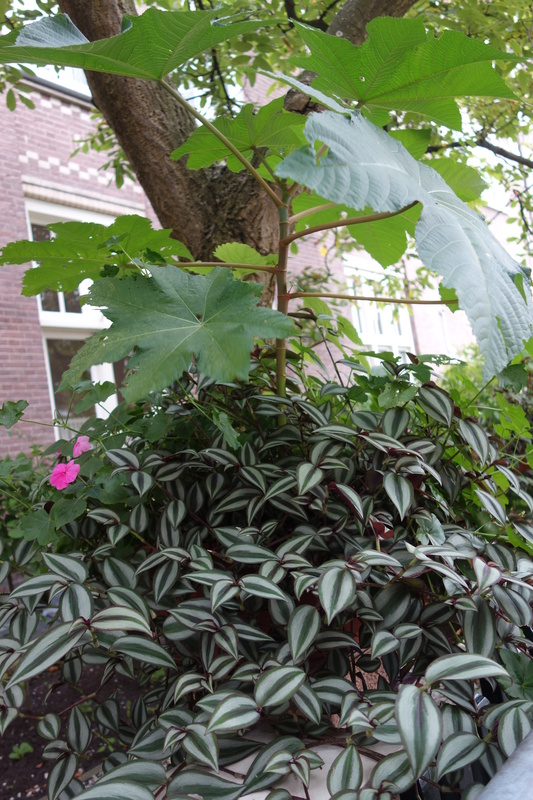 It’s tucked into the Plantage district, a green area of central Amsterdam, near a big public park and the zoo. One of us took this opportunity to sit in the cafe and read, but I did my best to explore the compact, diverse plantings, ranging from water garden to desert, in the hour we had before closing. The water garden featured these beautiful tropical leaves – shades of the Oxford Botanical Gardens (which I really should report on even if my visit was back in 2009). 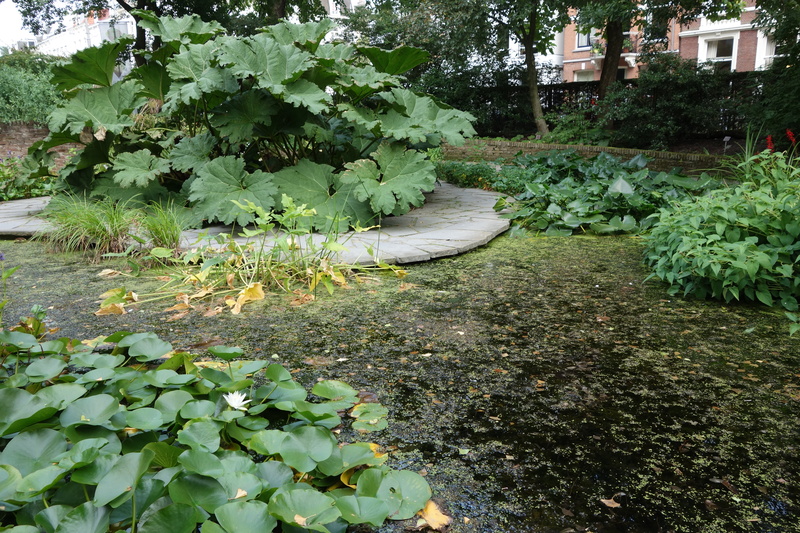 The water garden was roughly circular, with these giant water lilies (they start them from seed in May) in the pond, while a huge gunnera plant, which you see everywhere in English gardens, dominated the central point. I couldn’t resist closeups of the blooms. But the garden is really known for its collection of cycads, primitive plants that have been around since before the dinosaurs. They mostly lived in a glasshouse, but some were growing along the paths. This one is so rare that it lives in a cage, apparently. 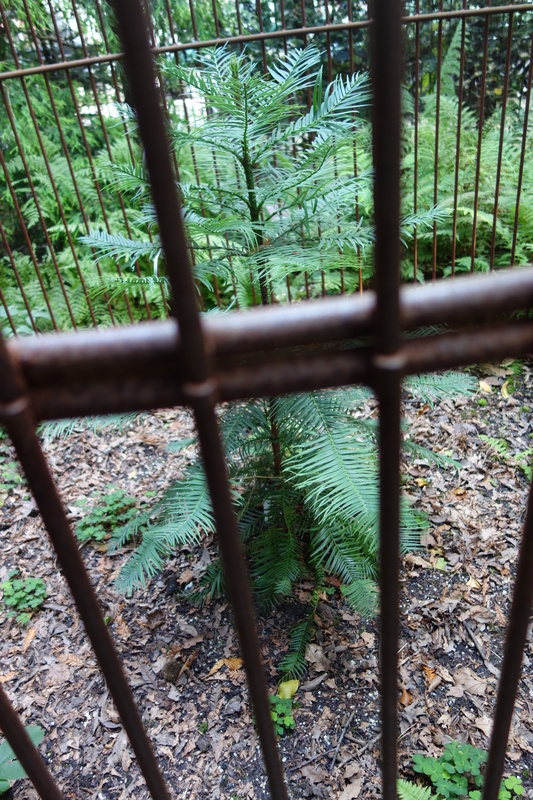 I think it’s the Wollemi pine, known only through fossils until it was collected in Australia in 1994 and distributed to botanical gardens around the world to keep the species alive. 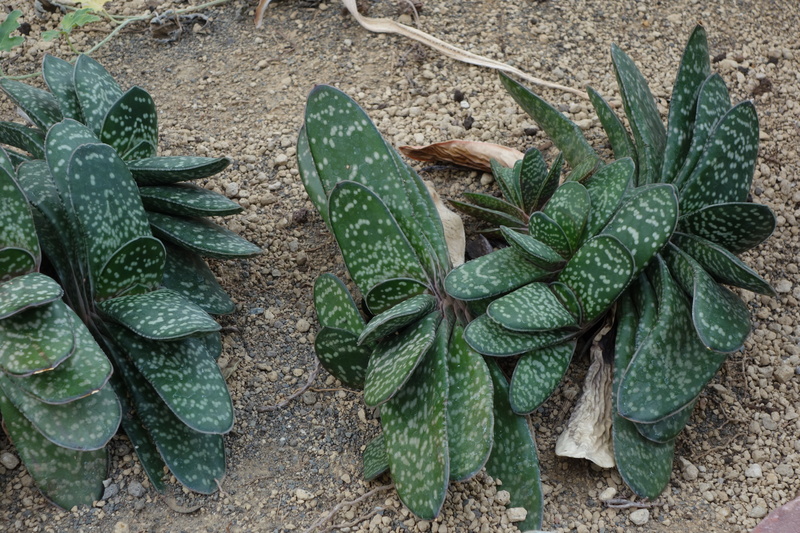 The glasshouses are renowned although I have to confess that I was underwhelmed, perhaps because these plants don’t interest me too much. In fact, I have no pictures of them so you will have to look at this one from their website, which does display their elegance but gives no sense of scale. 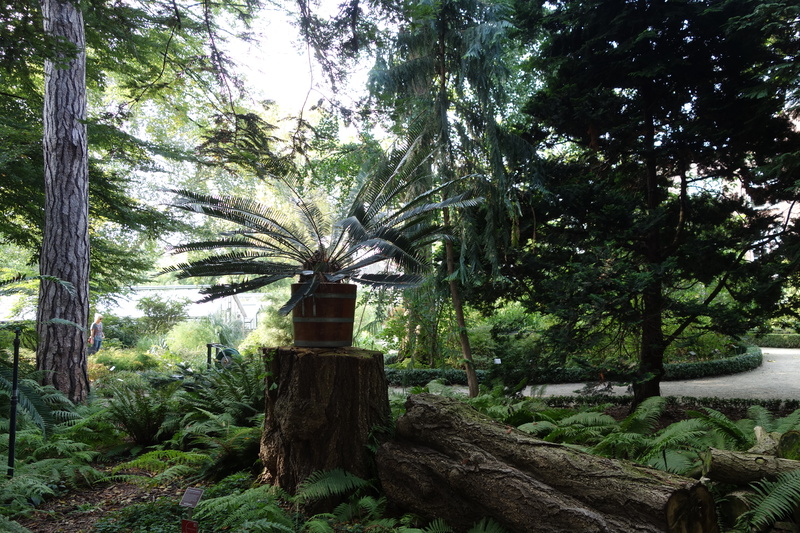 Both in the glasshouses and along the paths are plants first collected by the VOC in the East Indies in the 18th century, including coffee plants from seeds brought here in 1706. They formed the basis of the coffee plantations later established in South America. On the other hand, the butterfly house was enchanting. 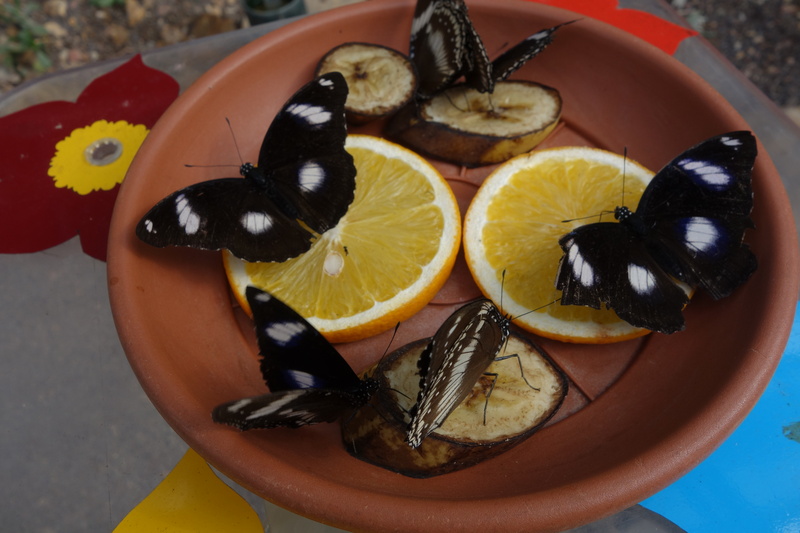 How could you not like these butterflies? Hypolimnas bolina, according to the sign, that live on sweet potato vines and flourish in Madagascar and New Zealand. 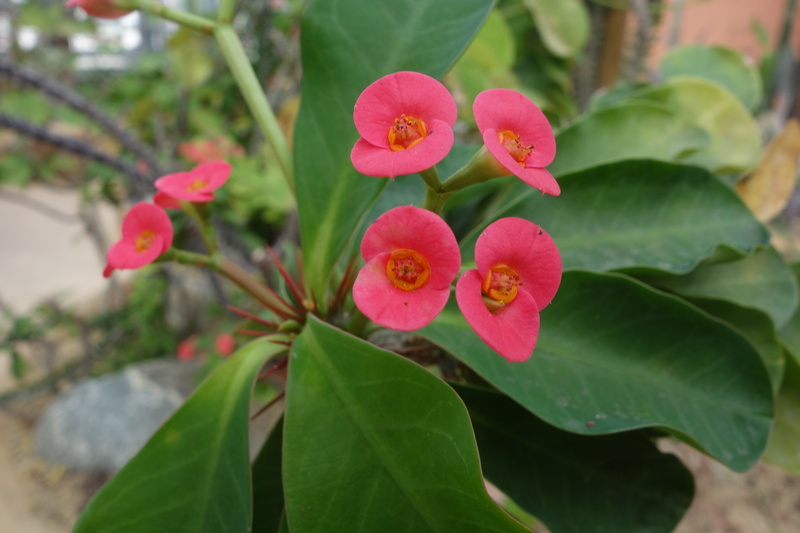 In the green houses were tropical and desert gardens, the latter of which I fell in love with for their shapes and patterns. This one looked like stacked tongues (but in a good way). 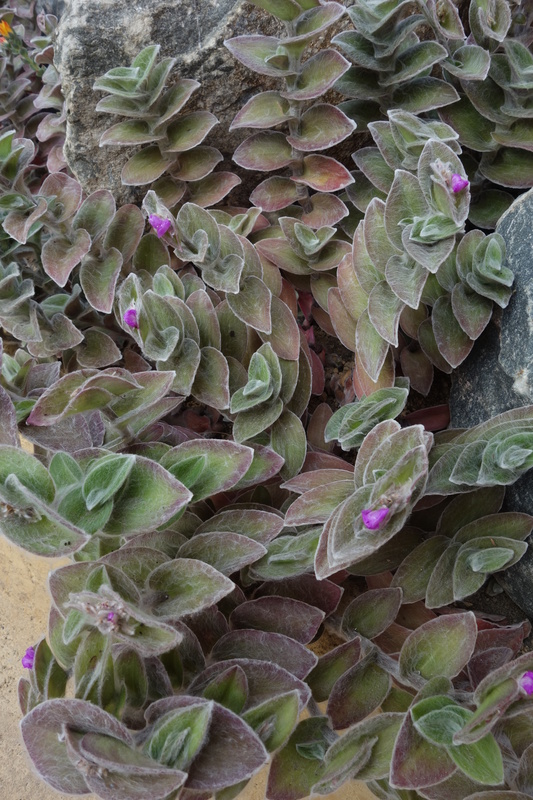 This one is some kind of tradescantia, weirdly: sillamontana Matuda from northern Mexico. Softly fuzzy and subtly shaded in purple and green. I had no idea that spiderwort could be so succulent. I loved these flowers as inspiration for applique. Finally a small tree that is actually clethra – a bit scary that it could get that big. 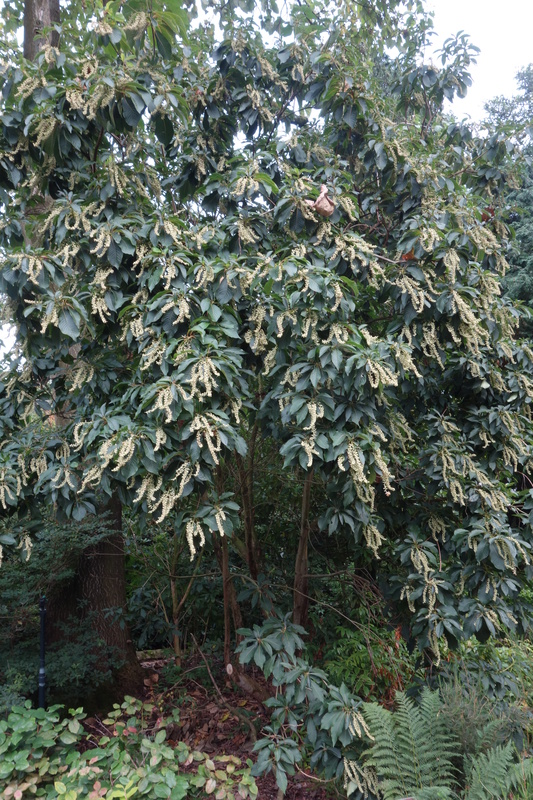 C. arborea Aiton, native to Madeira, so I probably don’t need to worry about my C. alnifolia. 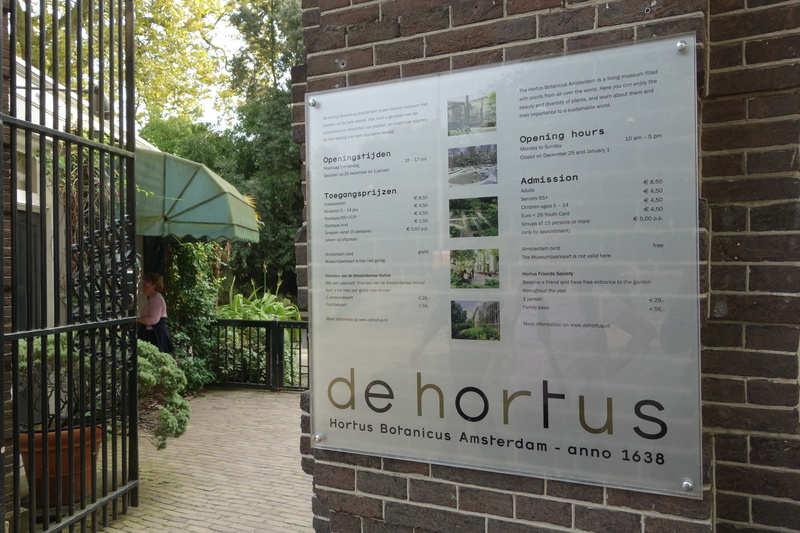 My favorite story from the arboretum is about the famous 19th century director, Hugo de Vries. 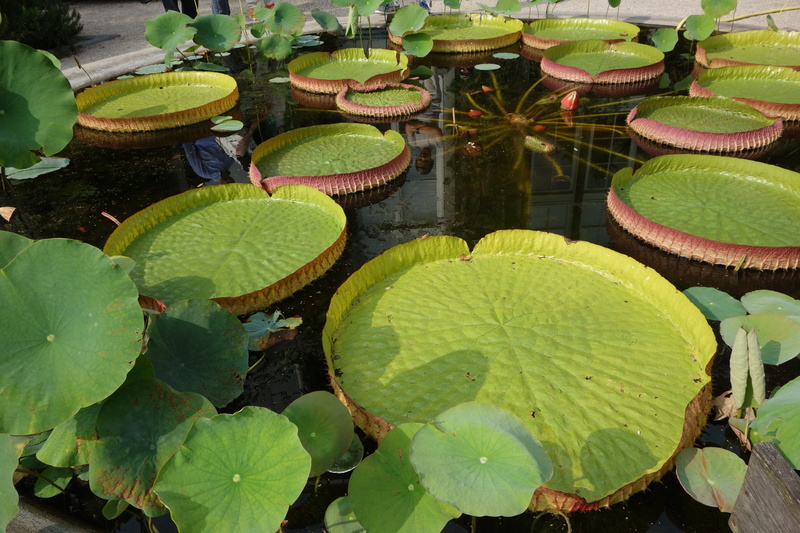 He once threatened to leave unless the board installed the glasshouses that allowed him to display palms and cycads. Another perk was the installation of a private gate on one side of the garden, that opened on the street directly across from his house. If you like your director, make it easy for him to stay! 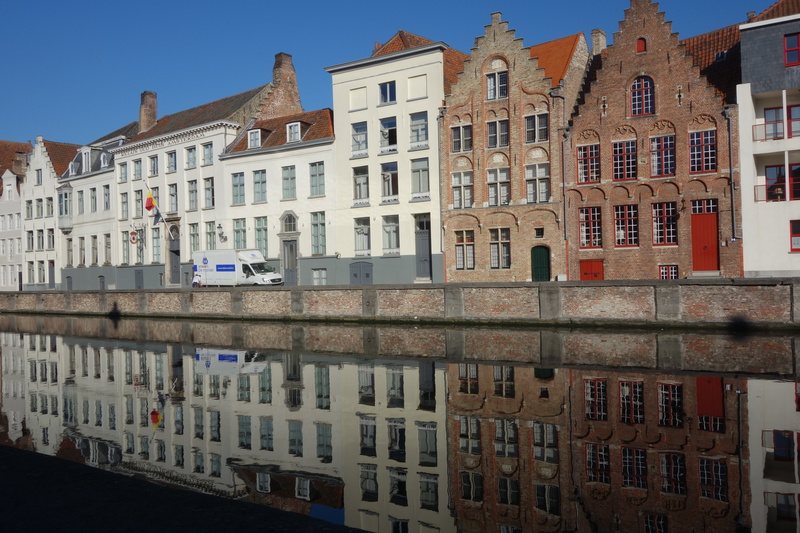 There are many reasons to visit Bruges. 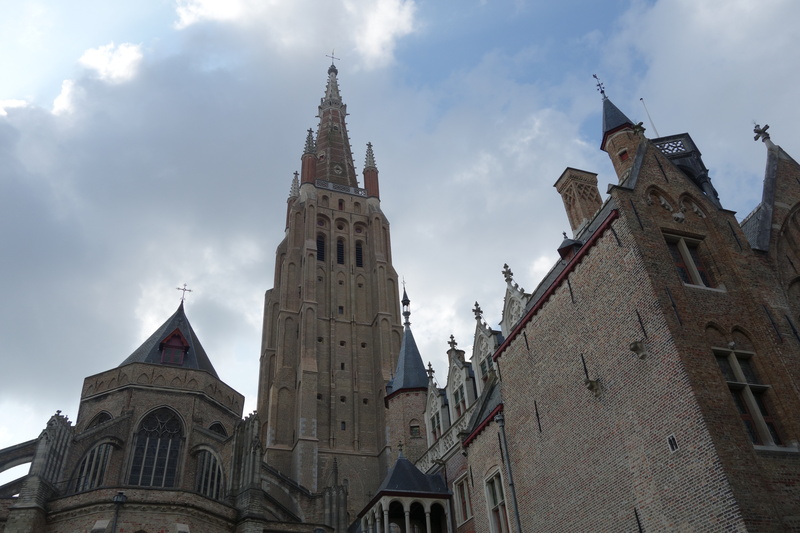 It’s a beautifully preserved medieval city whose center is a UNESCO World Heritage Site (cross another off the list). 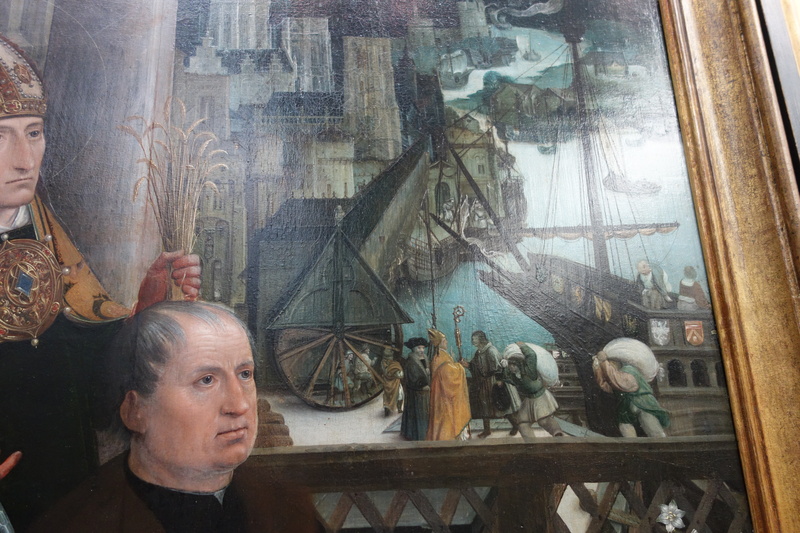 It houses a great collection of Flemish Primitive art, at the Groeninge Museum and the Memling. 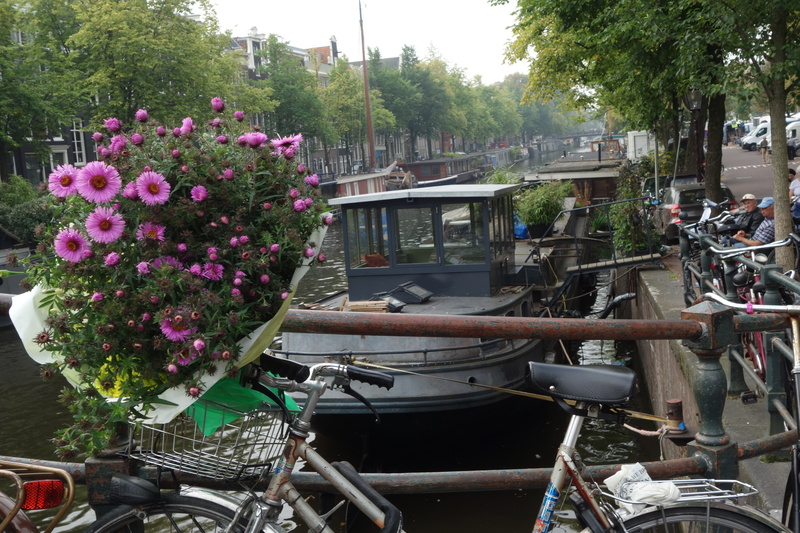 It’s filled with canals, gables, beer and frites. But most of all, dear reader, it’s about Niccolò. The first book in Dorothy Dunnett’s masterful series, Niccolò Rising, is set in Bruges, where Niccolò, an open-faced apprentice in a dye shop, is gradually revealed to be a maker of puzzles, a shrewd businessman, a reader of character and a complex character in his own right. The 15th century world of trade and diplomacy is described as only Dunnett can do – obliquely, allusively, but with the discerning eye of the miniaturist painter she was. 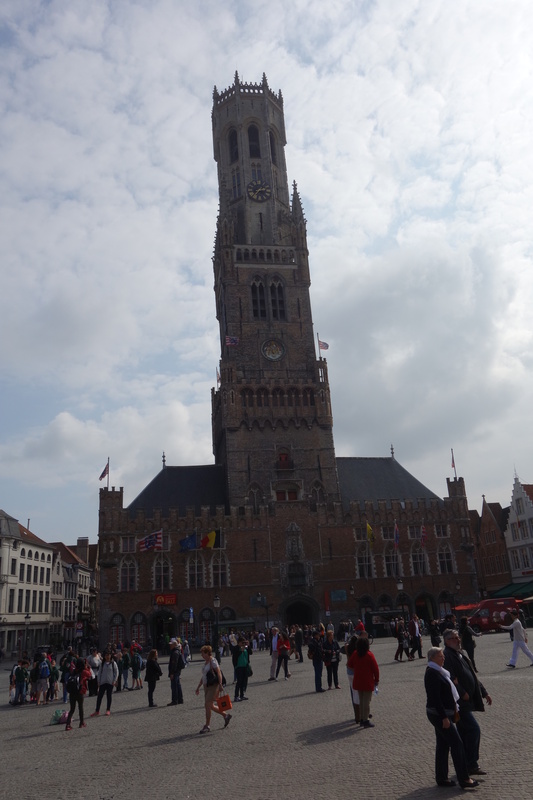 Luckily, the Dorothy Dunnett Society has published a booklet on Bruges that points out many of the highlights (though I must say that a map consisting of numbered dots on a square with no streets is not a map, for heaven’s sake). The first sighting was the bear on the facade of the Porterslogie. 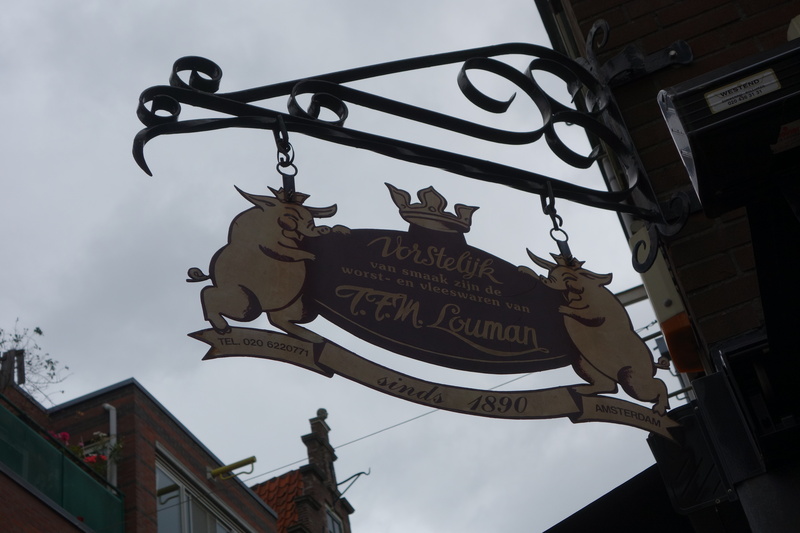 The White Bear, the het beertje van der logie, does not look down at his peers but up, to the clouds and the rooftops. He wears a high golden collar, and golden straps cross the white painted fur of his chest, and between his two paws he clutches the red and gold shield of the city. 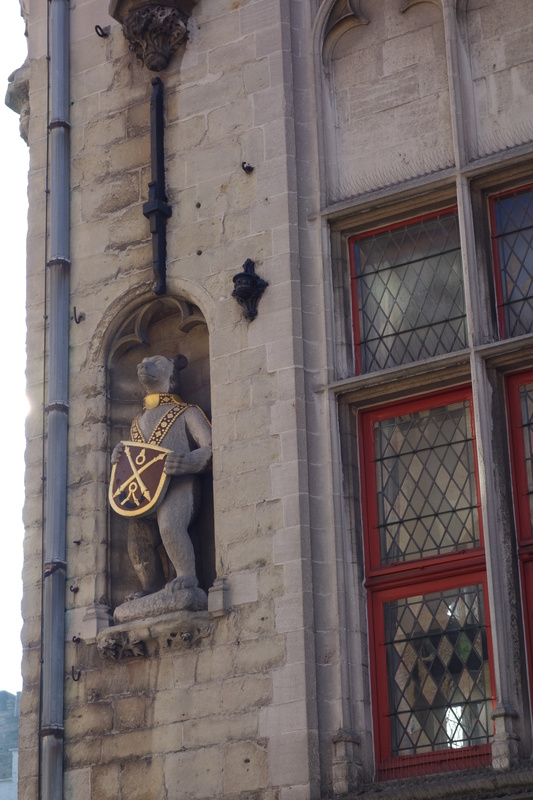 Niccolò is escaping from Simon in a wild chase that involves dogs and cats both alive and dead, a jump from a bridge into a barge along the canal and finally Niccolò appearing (to Simon’s rage) next to this bear, the symbol of Bruges, high up on the building. As other Dunnetters have pointed out, there is really no room here for Niccolò, who’s a big man, but no matter. Just seeing this was very exciting. 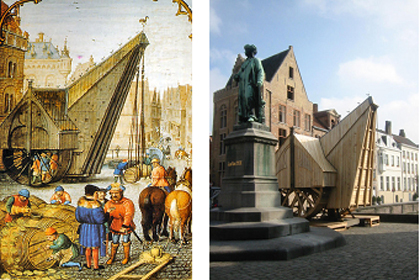 In the Market is, of course, the Belfort, the center of trading in the 15th century. 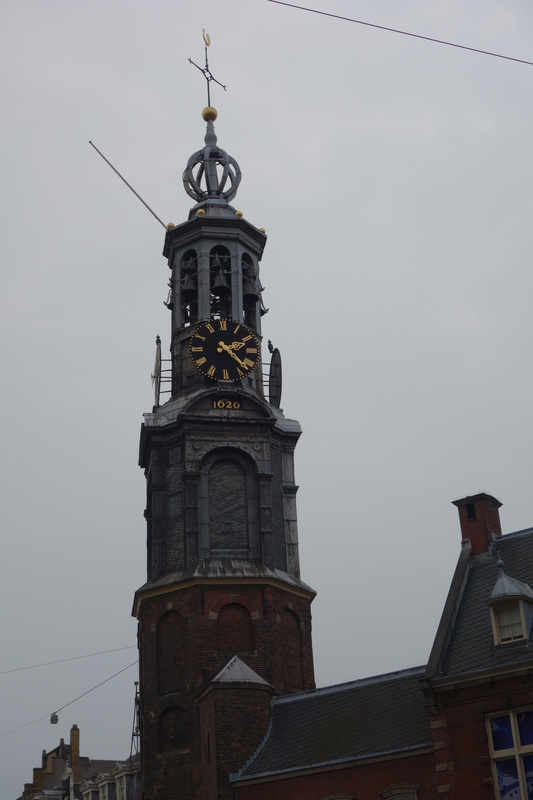 Announcements were made from its tower via speaking trumpets. Simon is walking through the Market when he hears the bells and trumpets from the tower warning of the fire at the Charetty dyeworks. You have to imagine at least this many people swirling around, but of course the square would have been of packed earth back then. 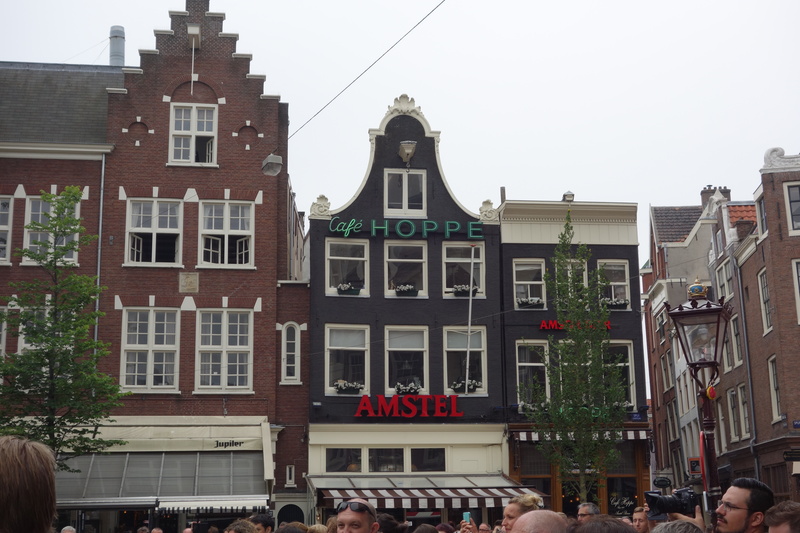 One of the buildings here is posited as the house where Katelina stayed during the Carnival. 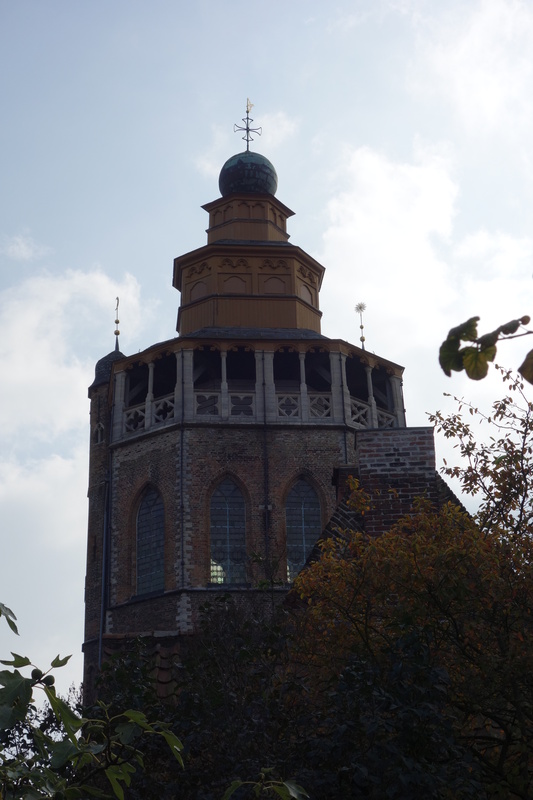 The other major site is the Jerusalemkerk associated with Anselm Adorne, a historical figure who appears throughout the eight-book series. His father and uncle, having lots of money and being very religious, built this church as a replica of the Church of the Holy Sepulchre in Jerusalem. Marian and Niccolò were married here, and the Adornes were, in real life, buried here – at least Anselm’s heart was, his body is in Scotland where he was murdered. Here is their tomb. 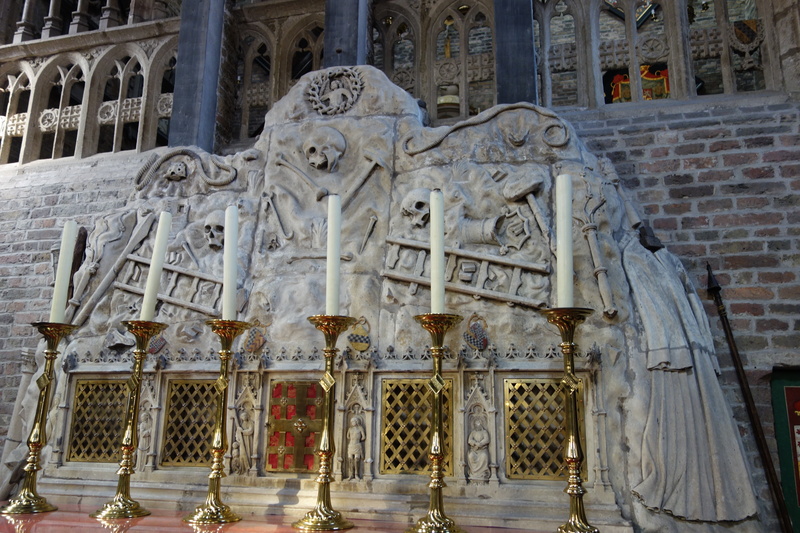 It’s a very small church with a morbid altar covered in skeletons and skulls. The church also contains a sliver of the true cross (so they say). The picture is a bit blurry because I was so excited – no, actually because it was up high and behind bars. 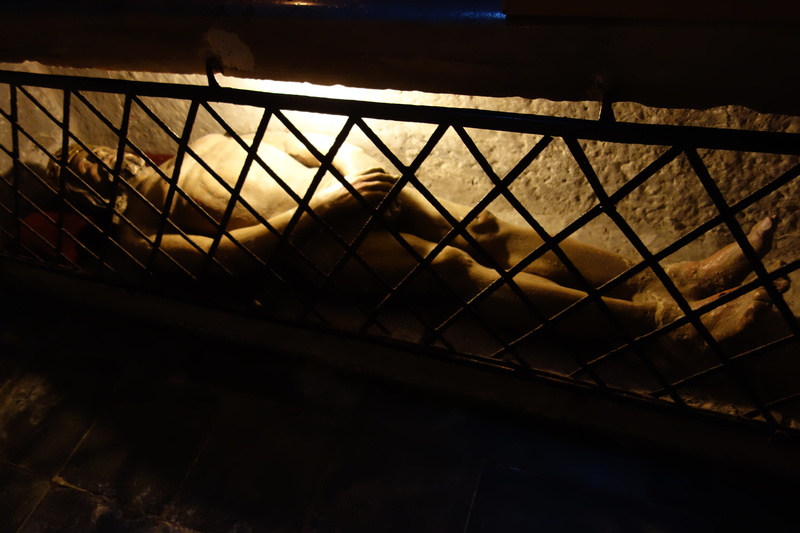 And here is a naked life-sized effigy of the body of Jesus, tucked into a tiny crypt you enter by crouching down and going through a hobbit door to the side of the chapel. 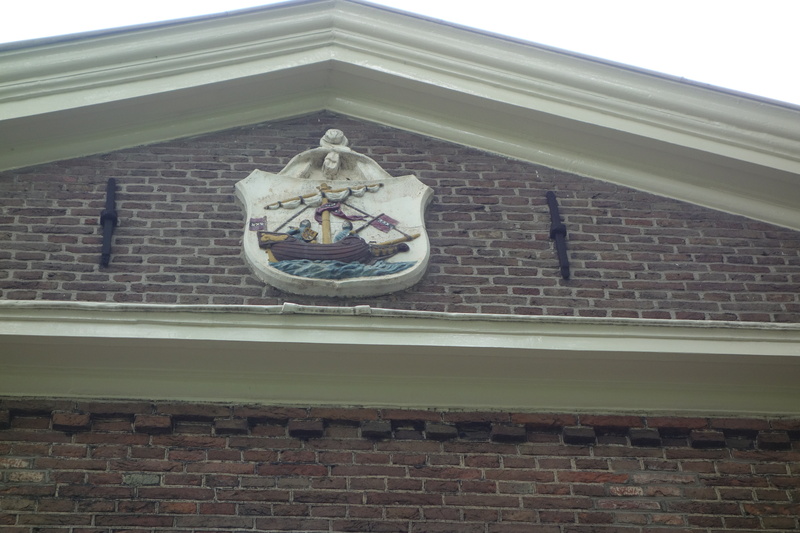 In recent months the Adorne Foundation has installed a terrific short film and s display of artifacts in the former almshouses adjoining the church. The film in particular gives a very good overview of Adorne’s accomplishments as a diplomat and civic figure (I know that’s a dull description, but Dunnett brings it all thrillingly to life). I was very chuffed to see it all. 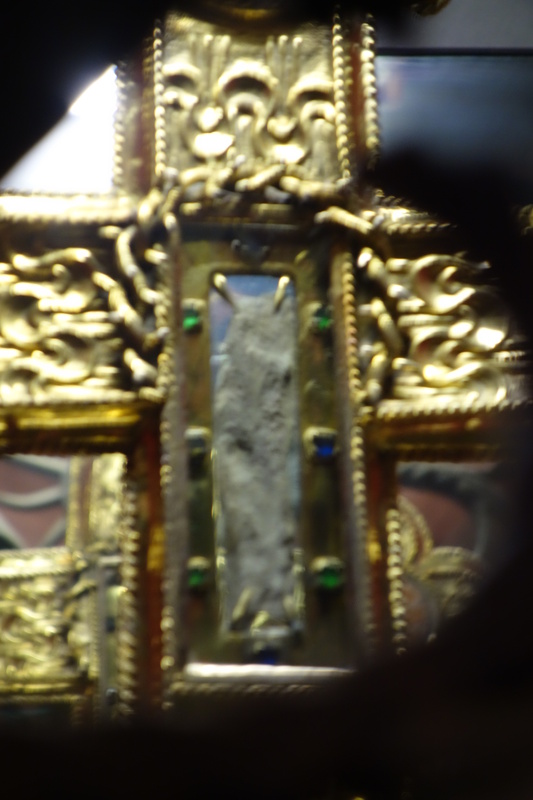 Speaking of holy relics, we also saw a vial of Christ’s blood – really and truly! 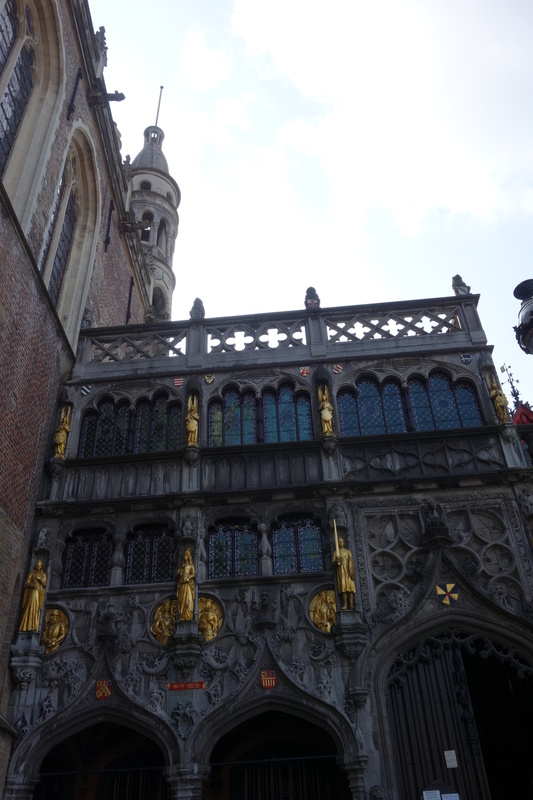 It was at the Chapel of the Holy Blood, of course, which is referred to in the books in conjunction with the annual procession on Ascension Day. It’s still celebrated as a religious holiday as well as for the release of Flanders from French rule. 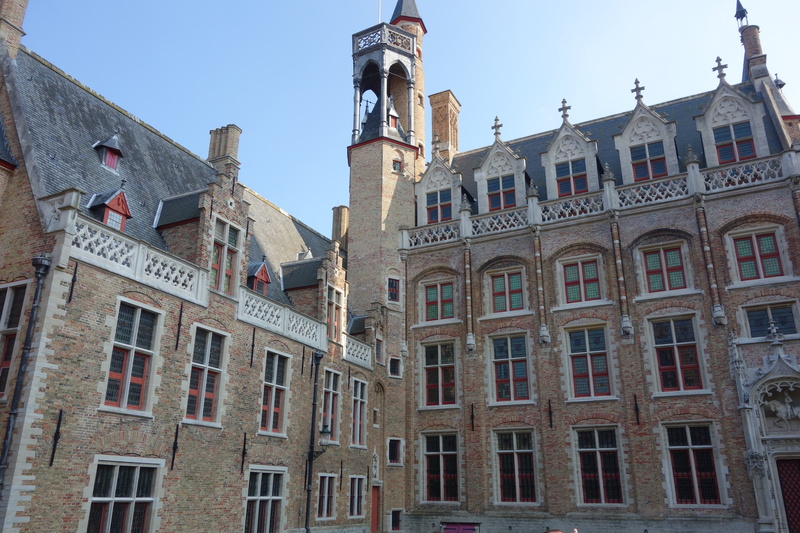 The Gruuthuse mansion was unfortunately closed for renovation, but we did get to see the outside. Here Niccolo meets Katelina when she tells him about her marriage to Simon, and then meets Gelis after his African journey. 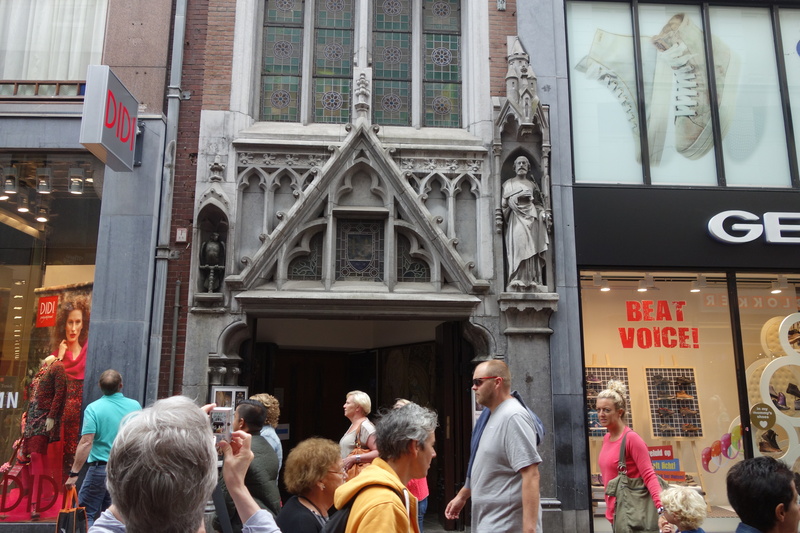 Right next to the Gruuthuse is the Church of Our Lady, where Simon, Katelina, et al. 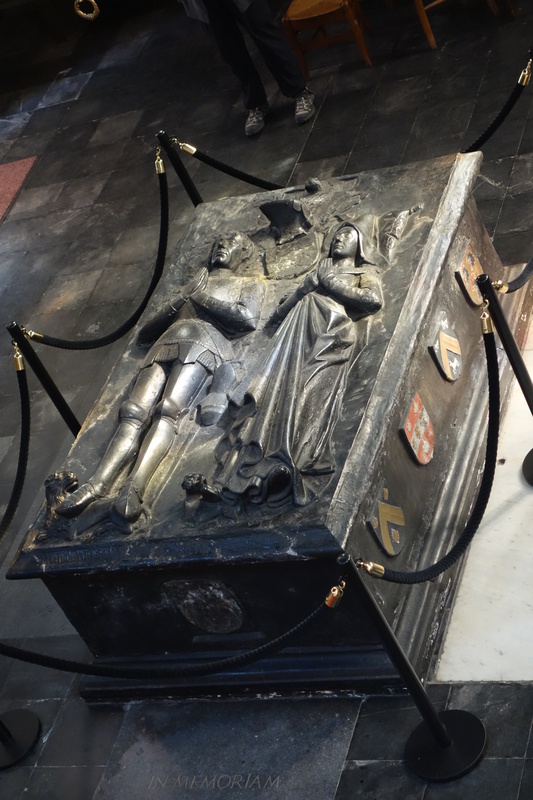 attend a requiem mass for the King of Scotland and where the Gruuthuse family had an oratory that allowed them to attend church without leaving home. 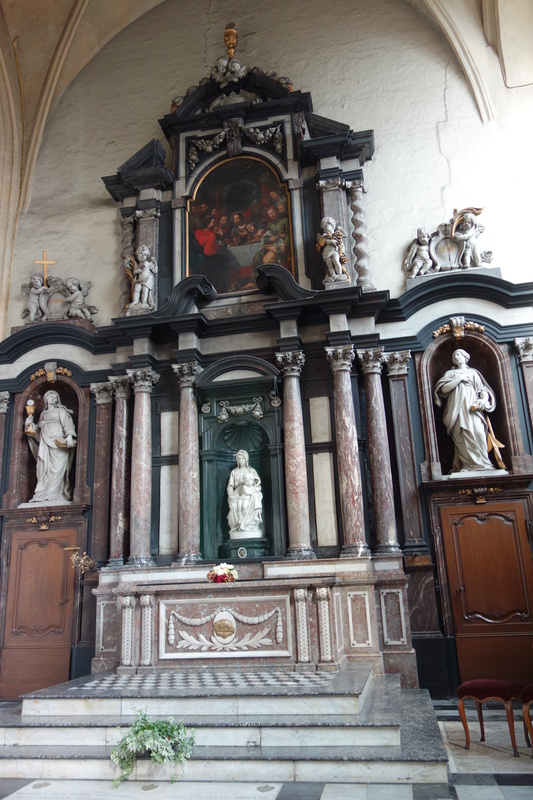 There’s also a Michelangelo Madonna and child sculpture here, which you can see for a small fee. A man-powered crane lifted goods from the barges on the canals into the warehouses. It was a treat to see the crane in a couple of paintings, including this one at the Groeninge Museum. Look carefully to see the men walking along the steps of a crane like hamsters in a cage. Finally, the first book opens in Damme, a small town about four miles from Bruges where goods came in starting in the 12th century, and also where I biked on a half-day bike tour (more to come). 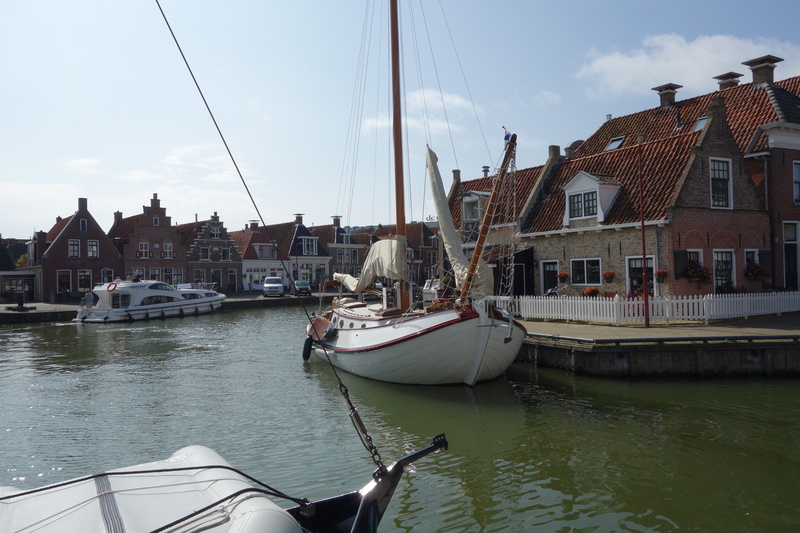 It’s here that we meet Claes in the opening pages as he and his friends are sailing down the canal in a bathtub meant for the Duke of Burgundy, and where Claes manages to sink the cannon. More significantly, it’s where Claes first meets Simon and Katelina. 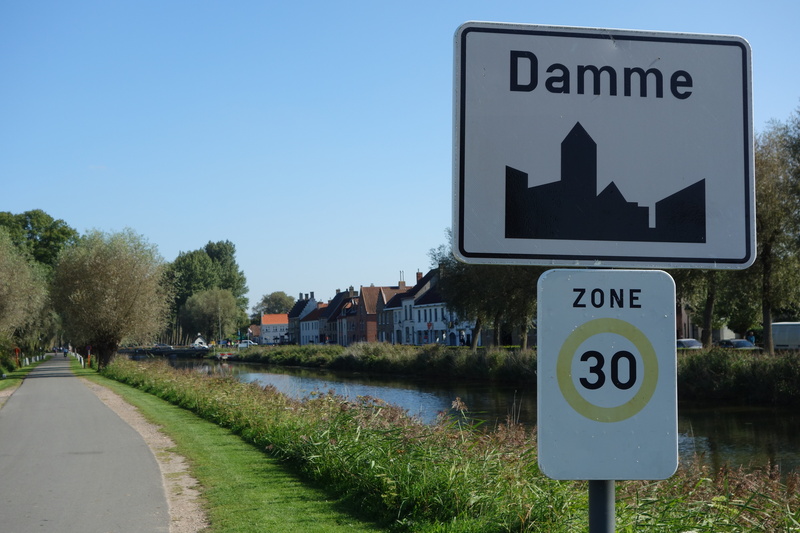 My bike ride to Damme was delightful on a bright sunny day, but that’s a story for another post. We met our guide, Chris, at a brown cafe just a few blocks from our apartment. We had passed it repeatedly but never stopped in. 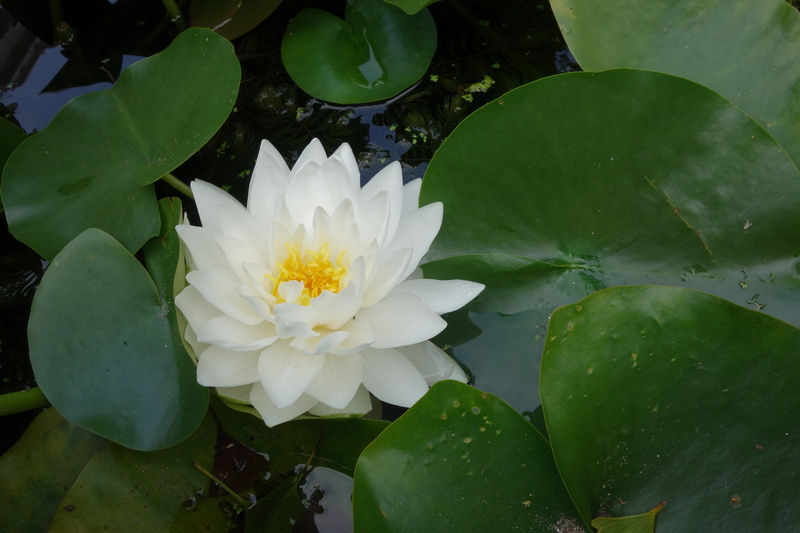 It turns out to be a very old and beloved place, run by the third generation of the family. 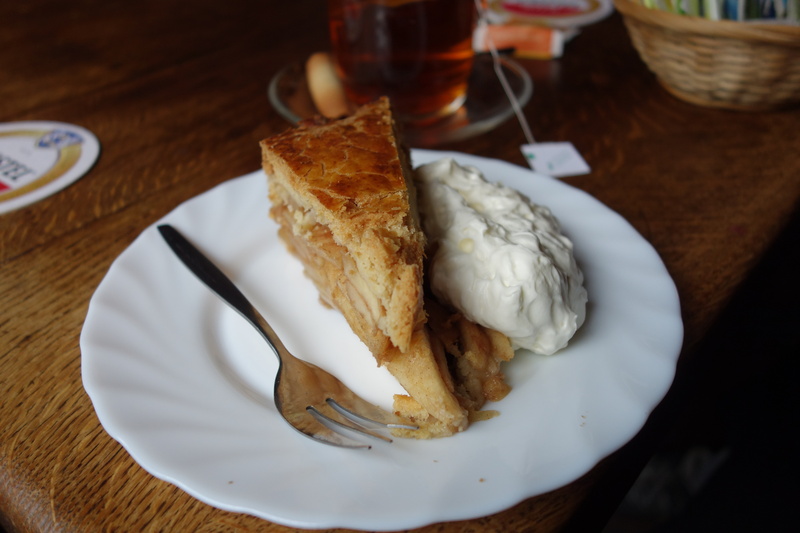 Chris got us started with a piece of the best apple pie I have ever eaten. The crust was not flaky like American crust but crumbly though not cake-like either. Served with whipped cream on the side, it was perfectly delicious. 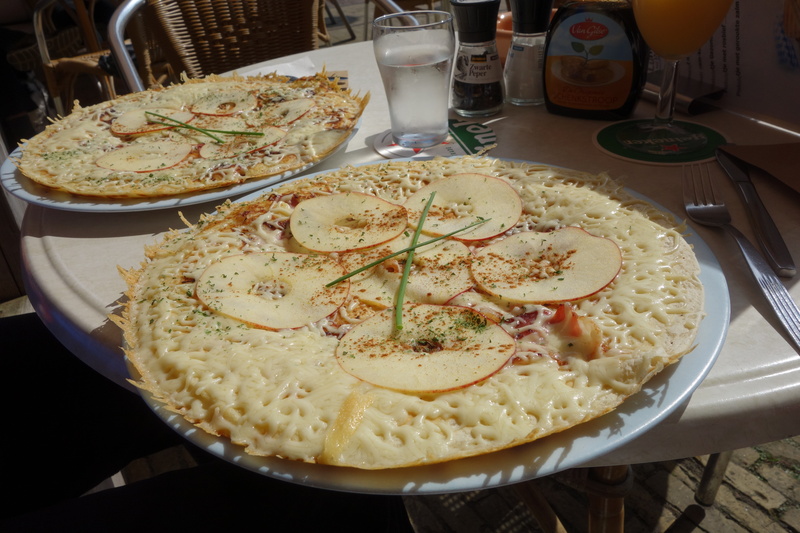 Chris explained to us that the Dutch would eat a piece of apple pie almost any time of day, including breakfast – and here I thought the Parrs had invented the custom! Bill Clinton had stopped by here (in his pre-vegan days) and there was an article and a thank you letter from Bill on the wall to prove it. If it’s good enough for Bill, it’s good enough for me. Here’s a picture of the enormous pie he cut our pieces from. After this we wended our way to a butcher shop that has been in business since 1890 (or 1888, the owner asserted, “but we claim 1890”). Chris told us this was her favorite butcher and that she would travel from where she lives in the southern end of the city to come here for the best meat. 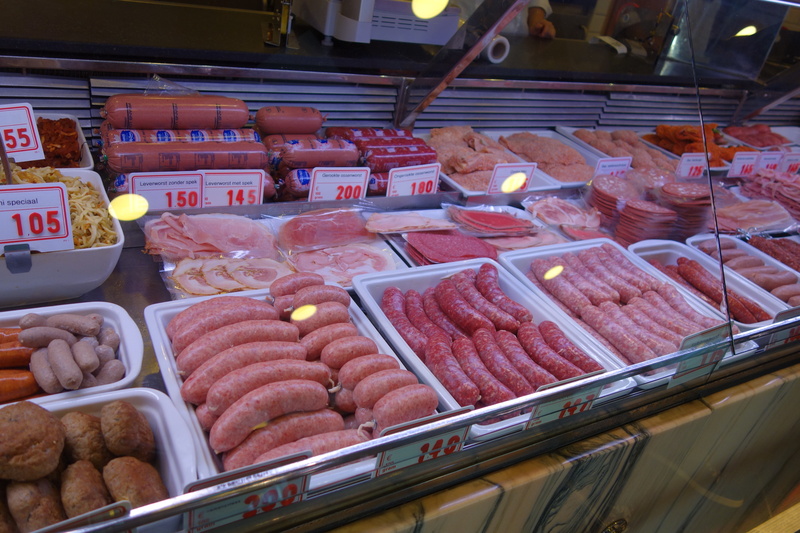 It was certainly beautifully displayed: ranks of sausages and salads followed by gorgeous cuts of meat. Yes, you have to like sausages to enjoy the photo above. Since there were only two of us on the tour (the other two people never showed up), we got special treatment. 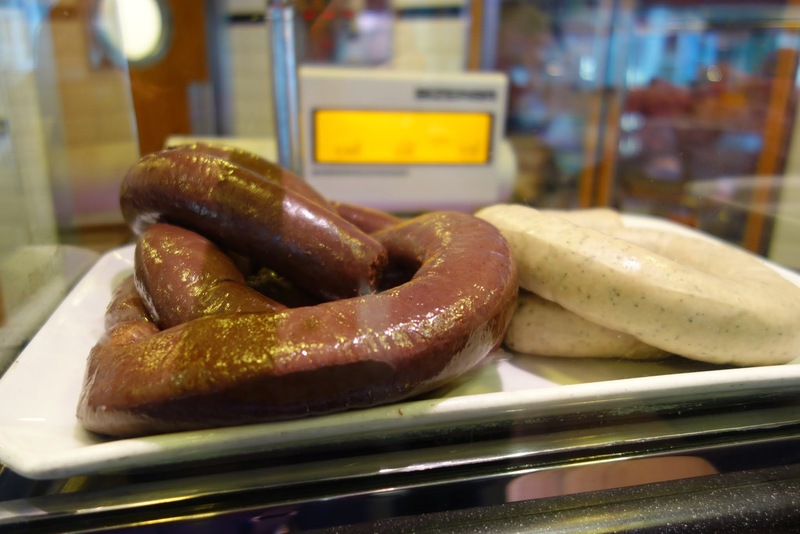 I tasted the blood sausage, which has a very grainy texture but was good, and Alison joked that she would go for a spare rib. The next thing we knew, the butcher had pulled off a couple of glistening shreds of deliciousness from the spare ribs in front of him. Then we came to the planned tasting: oxen sausage (made with beef these days) and a meatball. The sausage must be an acquired taste. Although it is smoked, it had the texture of raw meat. Not sure about that one. The meatball, traditionally served for diners at home on Wednesdays and the size of a baseball in traditional cooking, was fine but not remarkable. We left after taking pictures with the butcher, who grabbed a big hunk of raw meat to pose with. The Barking Fish was our next stop. By this time it was after noon, so we were ready (apparently!) for a bit of beer and some bitterballen. The latter are like Dutch tapas, essentially beef croquettes that you dip into mustard. People buy them frozen and deep fry them at home. 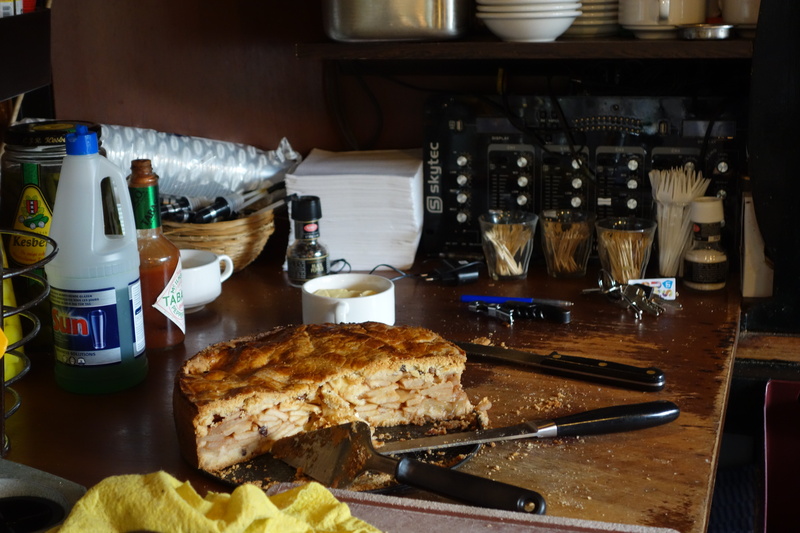 The crunchy outside gives way to a smooth inside that Chris described as stewed meat, but it’s better than that sounds – it has a very creamy texture. 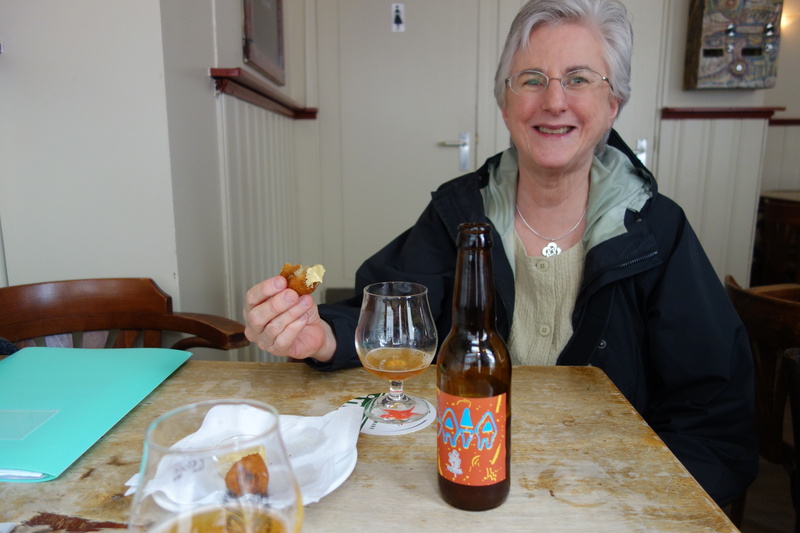 The beer was from a local Amsterdam brewery, an IPA that was light and a bit sour, very refreshing. 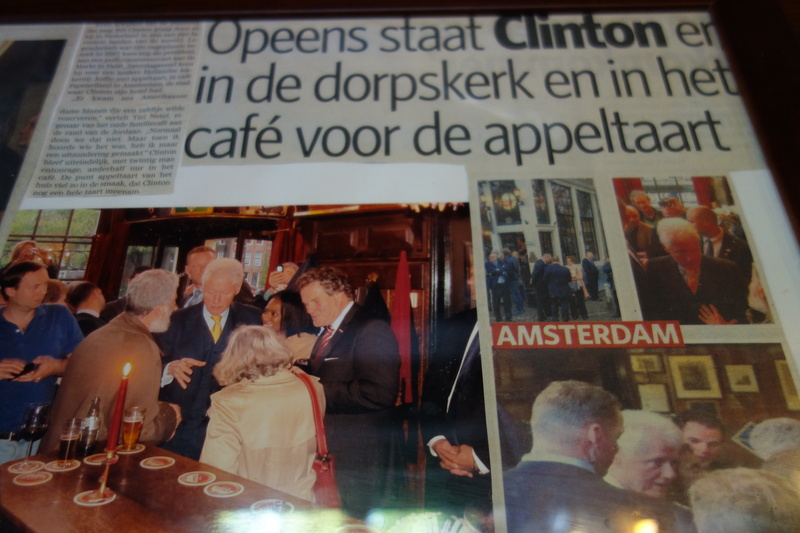 Chris described how this bar/cafe was known for its celebration of King’s Day (on the birthday of the reigning monarch). They make an affectionately mocking portrayal of the royals and turn it into a billboard (?) in front of the building. Apparently hundreds of people gather in their orange regalia and drink and celebrate. Last year’s billboard featured the queen photo-shopped into an image from Miley Cyrus’s wrecking ball video, which gives you a sense of the celebration. A good time is had by all. 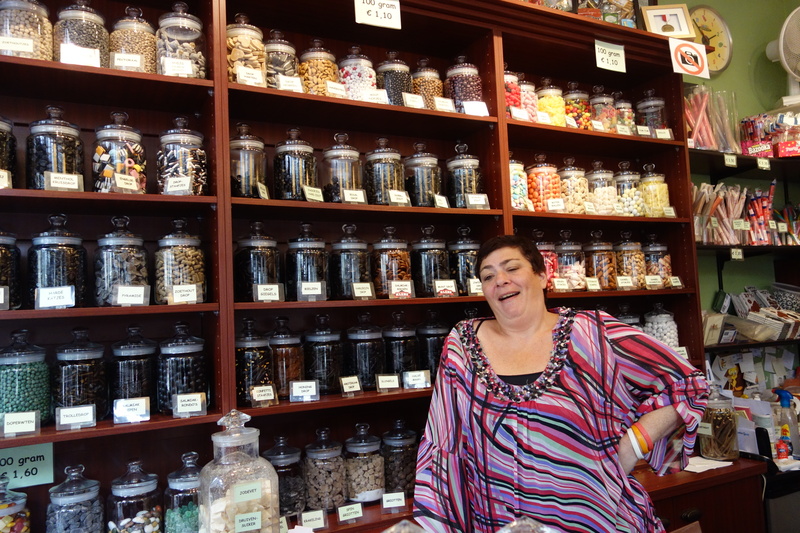 Mariska has dozens of varieties, and she had us try one with anise, one with honey and one salty. I can’t say I liked any of them though they were interesting to try. On instructions from Judy, I bought some licorice for the children: 100 grams each of mixed varieties including double salt. May they enjoy them! More Than Fish was our next stop, a fish shop run by a Dutch man and an American. Chris told us that they went to the fish markets early every day to make sure the fish was as fresh as could be. 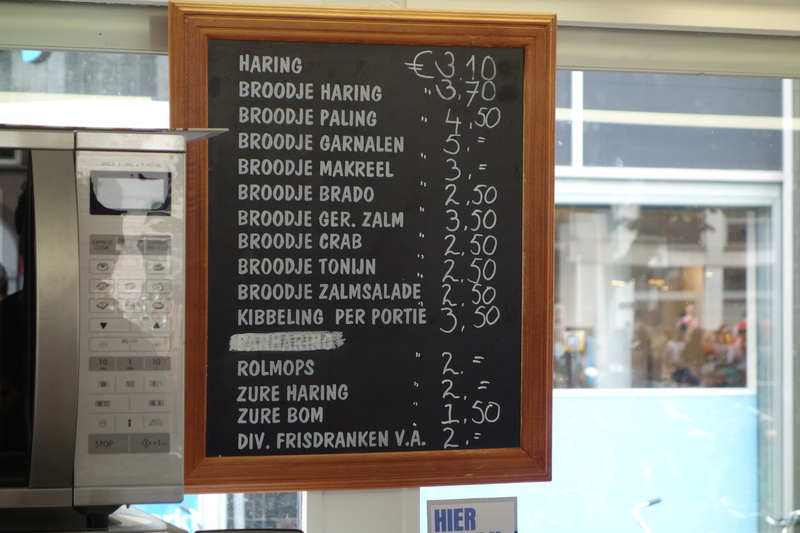 Having tried some raw herring at a stand near the Bloememarkt, I was interested to see if I could taste the difference here. Indeed I could! Chris came out with a big blue and white tray with raw herring and fried cod (side of tartar sauce). You eat the herring “with the flag,” spearing the herring, dipping it into the chopped onion, and topping it with a pickle. The fresh herring really was more delicate and delicious that what I had had before. And the fried cod was fresh, light, crunchy, delicious. 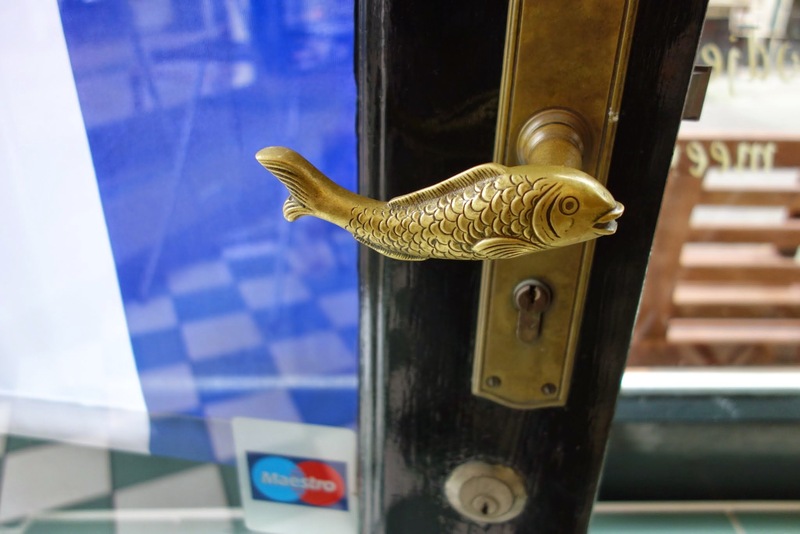 As we said farewell, the proprietors pointed out their fishy doorknob. Bye-bye! You would hardly credit that we could eat another thing, but almost four hours had gone by and we had really just nibbled (well, except for the apple pie and the bitterballen, which disappeared immediately). 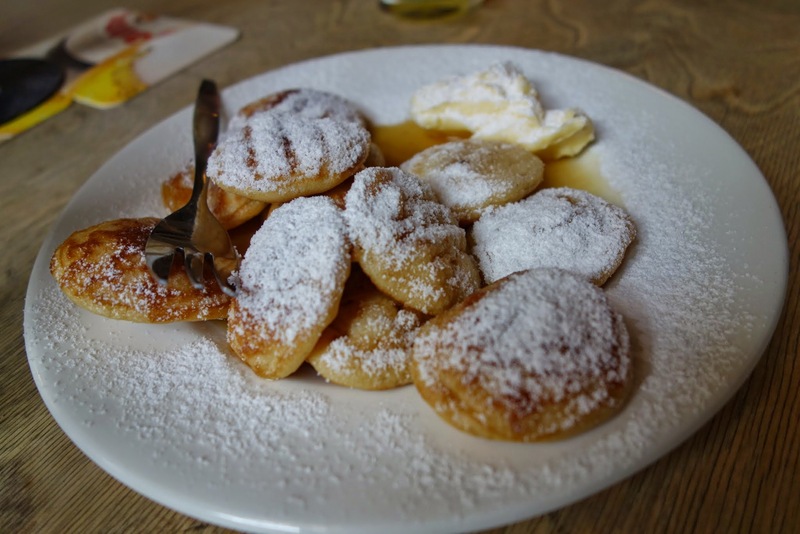 Our last stop was a cafe where we had pofferjes, little yeasty pancakes served with powdered sugar and maple syrup. They were so little that we kept having just one more until the two of us had eaten them all (one serving shared, I rush to point out). They were a delightful end to the tour. 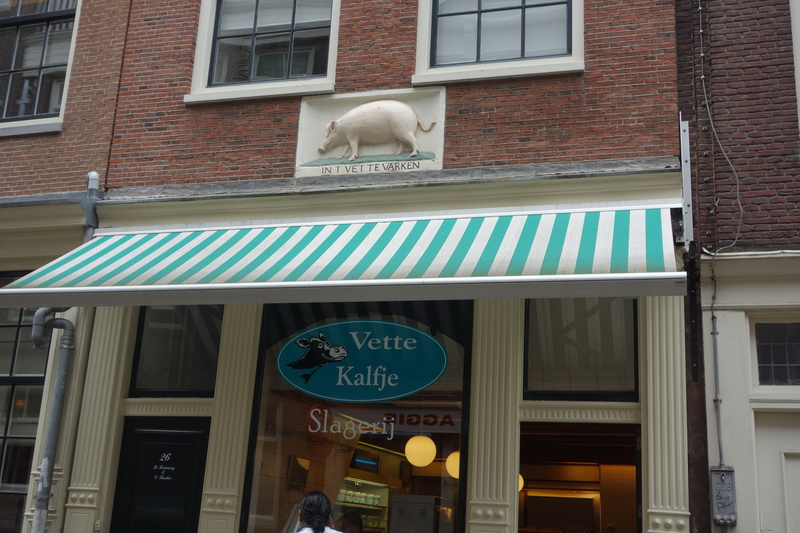 We thanked Chris profusely for a fascinating experience, where we learned something about Dutch customs and culture as well as eating mostly delicious food. 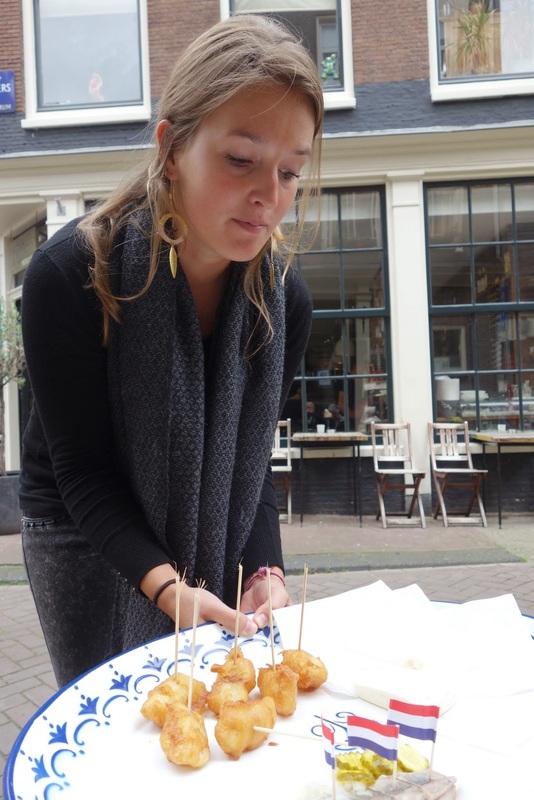 Though the history tours can be fascinating, there’s something about the food tours that makes them more fun. Could it be the food? 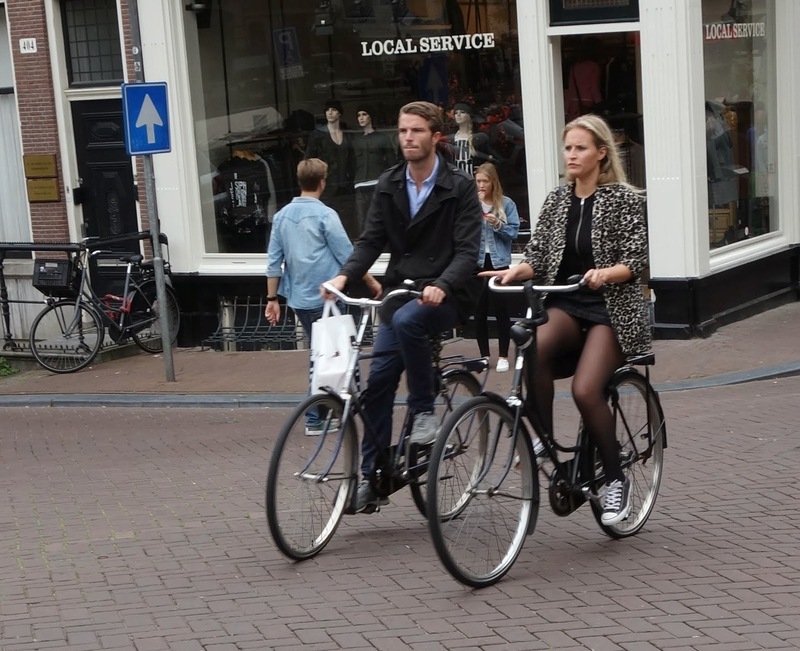 A selection of cyclists. 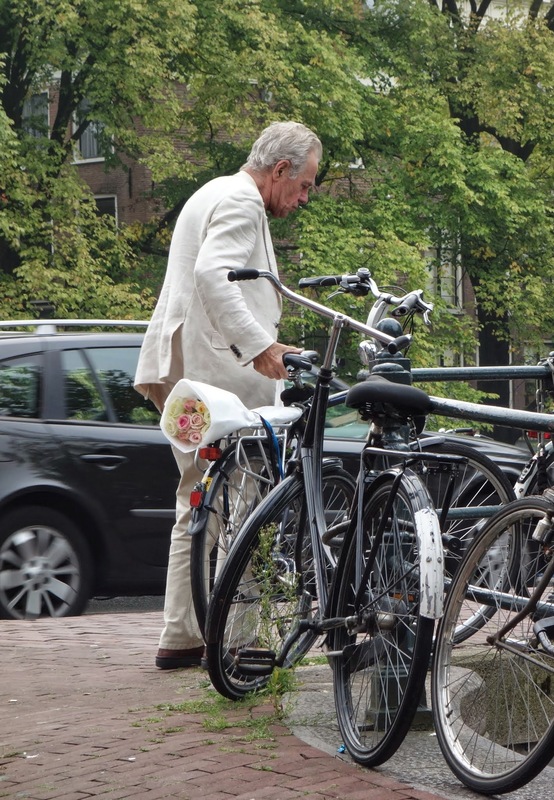 I don’t yet have a photo of a cyclist in high heels, but it will come along. They are everywhere, just as everyone said they would be. They behave like my Prius – suddenly and silently they are right behind you. 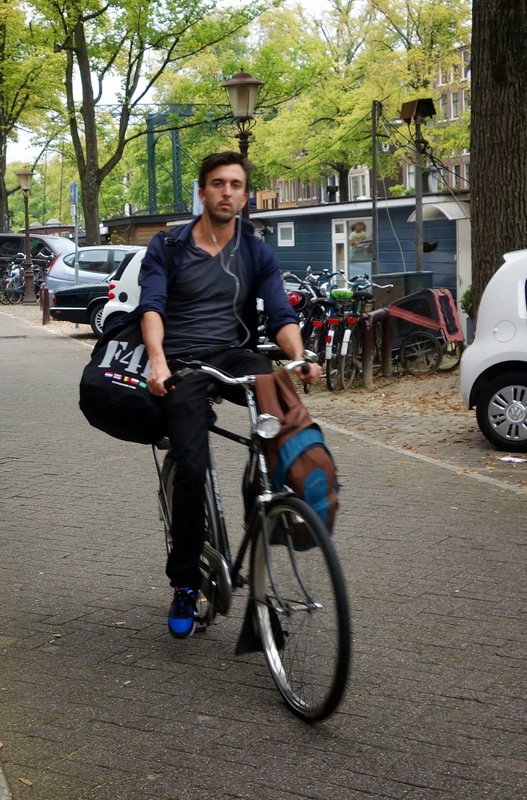 On the first day, we learned quickly which were the bike lanes and they do mostly keep to them. Some of them even signal when they’re about to make a turn, and some fewer of them even ring their bells when they’re right behind you. 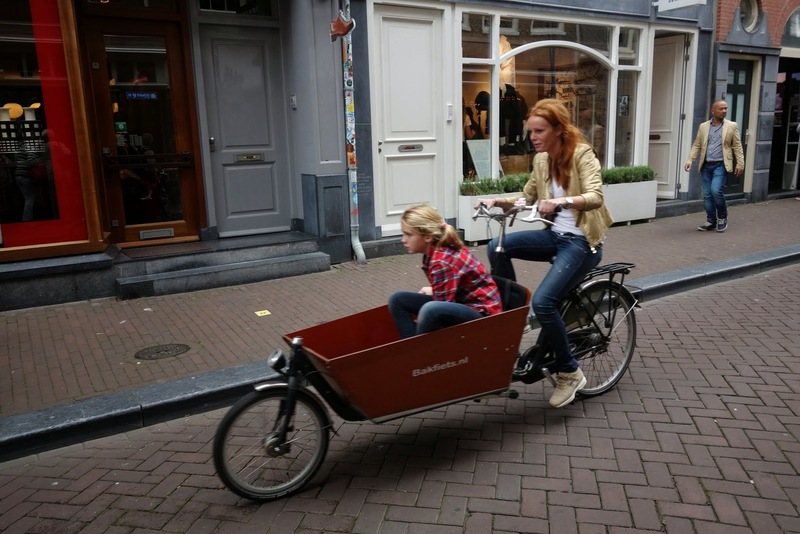 Here is how people ride bikes here.